What was Herring's Point? | Samuel Weaver Herring: a collectanea of his life, his times, and his place. Samuel Weaver Herring: a collectanea of his life, his times, and his place. On March 7, 1860, Queenborough pioneer Samuel Weaver Herring and his family moved across the Fraser River to the old Revenue Station, the first settlers in the district opposite the city of New Westminster. Samuel Herring and his wife Hannah pioneered in raising hogs and cattle, vegetable and fruit farming, dairying, wine making, ferrying, coastal trading, commercial fishing and fish canning. At New Westminster they ran a hotel, a restaurant and a fish and game store. Sam Herring earned a reputation for his distinctive personality in a district and era that attracted colourful fortune-seekers from around the globe. As a common man, he was as well-known as it was possible to be in the early days of British Columbia, written up in newspapers and history books, and visited by eminent dignitaries. He was possessed of enormous energy and individualism, and alloyed with Herring’s somewhat irascible character and tempered with humour, these traits would lead often to social friction, sometimes with amusing results. The Herring family resided for decades at the place that became known as Herring’s Point. In the years since, Sam Herring was lost to memory, swept away like river sand in freshet, with only the ghost of his character forever imbuing the district opposite the Royal City. Samuel Weaver Herring was born in Hager’ s Town, Maryland in 1830, to John Herring, the son of a German immigrant, and Mary (Mason) Herring. Hager’s Town was named after Jonathan Hager, who laid out a townsite on his property in 1768. Major transportation routes passed nearby, including the Great Wagon Road running from Pennsylvania southward through the Shenandoah Valley to Virginia, and the National Turnpike connecting Baltimore with the Ohio River and points west. John Herring kept a hotel there. Hagerstown is the county seat of Washington County, Maryland. The Herrings migrated to Pittsburgh, Pennsylvania in about 1833. By 1846 John Herring had been elected a Constable in the Independent Police of Pittsburgh, where the politics were highly charged and civic positions hotly partisan. Officer Herring did not shy from controversy, as first evidenced by the following press report from March of 1850. “On Saturday, John Herring, an officer in the Independent Police, having a bench warrant for the arrest of a man whom he understood had been taken into custody by the Mayor, proceeded to the office of that functionary to obtain the prisoner by virtue of a warrant from higher authority. The Mayor refused to surrender him, and denied the authority of Herring to act as an officer, alleging that he had not given the requisite bonds. Some words ensued, and Herring left the office without the prisoner. . .
On Sunday morning, the Mayor states, that he was attacked by Herring—towards whom he says he entertained no unfriendly feeling—on the street, in a very abusive manner, and that he was compelled at length to have him arrested, on account of his profane language and disorderly conduct. Herring, on the other hand, asserts that the Mayor stopped him, and commenced the abuse, using extremely violent and indecent language. He finally told the Mayor he was a fool, and for that, he states, he was arrested. John Herring’s second son, Sam Herring, was involved in pubic disputes from an early age. Working aboard the river steamer Euphrates in 1848, Sam was present when the Captain paid off the crew for a stopover. One crew member later demanded pay for the time ashore, and Sam Herring, as a witness for the Captain, swore that the crew had been laid off. Sam was arrested, indicted for Perjury, and prosecuted by the Attorney General of the Commonwealth of Pennsylvania. Appearing before a Jury, young Herring was noticed by the press. Daniel G Herring, a Painter, aged 24. Samuel Herring, a Pilot, aged 19. Angeline W Herring, aged 21. All the above were born in Maryland. Margaret A Herring, aged 17. Eliza S Herring, aged 11. William John Herring, aged 8. Thomas A Herring, aged 4. Tillman R Herring, aged 2. The two eldest sons, Daniel and Sam Herring proceeded to California in the same year, where they were counted again as miners at Yuba. The two gold rush adventurers would soon be followed by the rest of the Herring family. After their arrival in California, John and Mary Herring took up running a hotel on the bustling San Francisco waterfront. The location of the Keystone Hotel at 84 Davis Street was at the centre of port activity, situated near the landing of ocean and river steamers. In the 1854 city directory, John Herring is described as a “special constable,” Samuel Herring as “clerk,” and Mrs Mary Herring “Proprietess” of the hotel, all residing on the second floor. Controversy followed the Herring’s to their new home. In the spring of 1855, newspapers reported that “the whole family of Herrings, keepers of the Keystone Hotel” was charged with the assault of a servant girl. Mrs Herring was discharged, but John and Samuel Herring were convicted and fined. Sam Herring was by this time a married man. In early 1850, his future wife, Hannah Willard, aged 20, had resided in a wealthy parish in Dauphin, PA, in the household of the Governor of Pennsylvania, William F Johnstone. She was a native of Pennsylvania. Samuel and Hannah Herring’s first child was born in San Francisco in February 1856. They named him Tillman Willard Herring. The same year John and Mary Herring suffered the loss of their youngest son, San Francisco-born Alfred. He was just two years old. By this time the Herring’s were operating at another location on the waterfront , on Jackson Street between Davis Street and Drumm Street. The Keystone House was a 22-room hotel, with a parlor, dining room and reading room, furnished with fine mahogany and Brussels carpets. The Judge found reasonable doubt as to the grand larceny and dismissed the matter with a caution to Herring. That was not to be the end of the matter, however. It appears there was intense competition between rival hotels on the San Francisco waterfront. Only a couple of days after his acquittal Sam Herring was back in court, owing to another fracas at the Keystone. Sam Herring’s time in the Hotel business in San Francisco was up, and within a week notices appeared that the entire contents of the premises would be auctioned off in a “Large and Peremptory Sale.” The Hotel was taken over by John Allman and continued to be a source of many newsworthy and entertaining stories of waterfront life in the Bay city. Sam and Hannah packed their belongings and little Tillman aboard a sloop and sailed up the coast to Crescent City, California. Crescent City had been founded in 1853 to service new mines. The town grew rapidly and by 1857 had a population of about 800, four sawmills, a flour mill, cannery and its own newspaper. Here Samuel Herring and his wife Hannah had a daughter they called Annie Mary, born October 22, 1857, a sister to two-year old Tillman Willard. The Herrings sojourn in northern California was short before they once more rode the flood of opportunity, this time to the mudflats of Bellingham Bay in the northwest, where a booming settlement called Whatcom had pretensions to becoming the supply city for miners and traders into Fraser’s River in the gold rush of 1858. Among those who bought building lots from RV Peabody were the Pettibone brothers, who would later figure in Langley, Victoria, and Whatcom in later years. John Herring and his son Samuel Herring purchased Lot 5 in Block 33, on the waterfront. Situated on 13th Street, now West Holly Street, between E Street and F Street, the Herrings had a prime location. Bellingham Bay possessed extensive mud flats, its main drawback as a landing place. The Whatcom E Street Wharf Company included among its officers and directors such northwest notables as Messrs RV Peabody, William Utter, Alonzo M Poe, and HC Page. The intention of the subscribers, including J Herring and SW Herring, was to build a wharf 2800 feet in length, with a width of 20 feet and a “T” of 100 feet. The Whatcom boom was to be short-lived. A trail from Whatcom to the mines proved to be an arduous and lengthy journey compared with the ease of travel by steamboats, which began successful runs up the Fraser to Fort Hope. Governor Douglas of Vancouver Island controlled traffic on the river by means of an edict requiring miners to obtain licenses and customs clearance at Victoria, and with the assistance of the Royal Navy, he had the means to enforce it. Early in 1859 Sam Herring was still resident at Bellingham Bay. In March he advertised for any information concerning the whereabouts of the schooner Blue Wing. 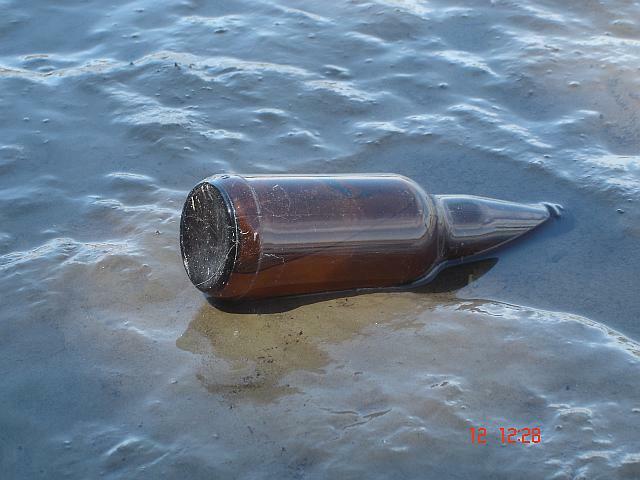 News had reached Bellingham Bay that she was missing, with some six to eight persons. The Blue Wing was a familiar trading vessel calling in ports on Puget Sound and along the coast up to Semiahmoo Bay and Vancouver Island. Among those on board were Ernest H Schroter and her Captain Henry Stowell. The mystery of the disappearance of the Blue Wing would remain unsolved for over a year. Details began to surface that the boat had been attacked and burnt to the water by Northern Indians, with all on board murdered. The same were also implicated in the disappearance of the Helen Maria, another vessel that also traded into Semiahmoo Bay. The failure of British authorities to retain the prime suspect, a man called Hydah Jim, would be a cause of dismay to Americans resident on the Sound and the subject of formal complaints from US officials to Governor Douglas. By this time Sam Herring had been on the move again, taking his sloop Aurora on the flood tide into Fraser River. The new Colony of British Columbia was inaugurated at Fort Langley in November of 1858. The officer commanding the military force of the new Colony, and also in charge of lands, arrived a month later. Colonel RC Moody did not like Langley as a location for a capital city due to its easy proximity to the American border, which he saw as a commercial and military vulnerability. He chose a hillside further downriver on the north bank, opposite a broad bend in the river named by surveyor Captain Richards “Queen’s Reach,” and there he set up a military camp he called Queenborough. 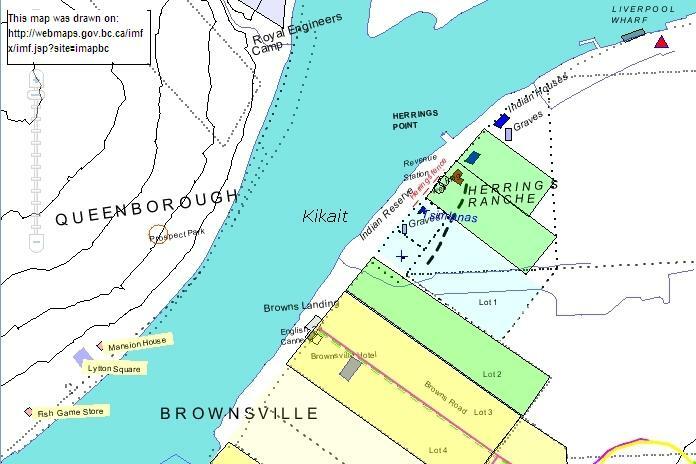 On the point directly south across the river, in the midst of an Indian settlement known as Kikait, a Revenue Station was established in February 1859 to collect miner’s licenses and inspect boats for customs sufferances. Hard by Indian houses and grave sites, a building was erected to house the revenue officers and a boathouse to store their boats. 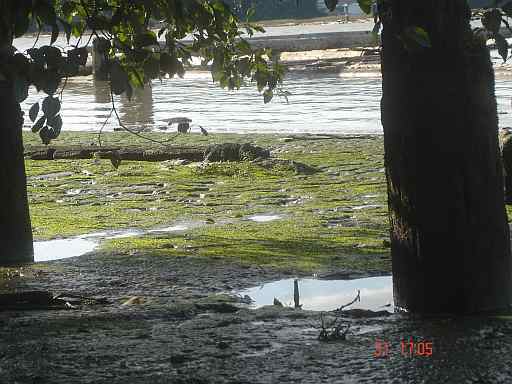 A narrow wharf was run out across the tidal flats, a well dug, and a pole was erected to fly the British flag. It was the first sign of civil government authority in the new colony, a gateway to the gold district. The Revenue Station was a fairly large building about 40 feet by 66 feet, comprising the office and sleeping quarters, barrack-style for the men. It was built up on piles, to keep it above flood-water. A long veranda ran the length of the front. Bevis originally was commuting down from Langley each day, but soon had a small house built at the Station to house his wife. The location of the Revenue Station had benefits not solely strategic. Prior to coming down to Queenborough, the Engineers and their families had been housed up at Derby, where there was cleared land, and Colonel Moody had bought a cow to provide milk for his wife and children. There was no pasture on the heavily forested hillside at Queenborough, but on the opposite side of the river, at the back of the outpost, lay some fine natural grassland. Moody soon had a “boat-house” erected at the Revenue Station. I beg to inform you that I have completed the building of the shed, which you directed me to make large enough to suit for a boat shed, for the station, it being 33 X 12 1/2 feet. It is now ready for the use of your cows when you think fit to send them across and I will be happy to see that they are taken care of. I enclose you the Bill of the lumber and trust you will have the kindness to cause the same to be paid. This most amenable relationship would be shortlived. A new Collector of Customs, W O Hamley, had taken charge of the Revenue Service from AC Anderson, and in the interest of reigning in expenses, promptly discharged most of the men. Captain Kirk would show up as a Master Mariner and Pilot at Victoria. WH Bevis also went to Vancouver Island, where he obtained employment in the Victoria Police before attaining the appointment of Lightkeeper at Fisgard Lighthouse. William Jeffray started an Express service connecting the Upper Fraser and Victoria. William Manson went back to coopering with the Hudson Bay Company at Langley. Charles S Wylde, friend of the Colonial Secretary, was kept on. Just below the North Camp was the hillside Colonel Moody chose for the site of a new city. 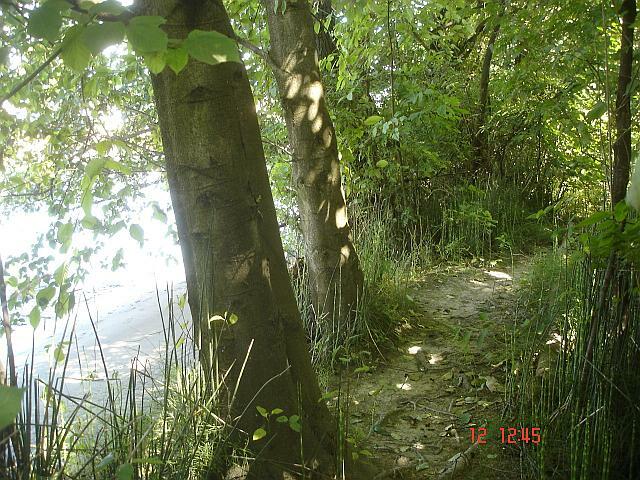 The first civilians to arrive at the town site came to the only clear spot, a beach at the base of a ravine. At this place, which would become Lytton Square, they set up tents while waiting for the trees to be felled. Among the first to arrive was the Herring family, lately of Whatcom. Hannah Herring, one of the first residents of Queenborough, was carrying a baby, a brother to Tillman Willard and Annie Mary, most likely born in April ’59 at Whatcom, just prior to her leaving that place, although one Census records his birthplace as British Columbia. According to a newspaper account, Lady Franklin, on her first visit to British Columbia in 1861, took a shine to the young lad, and desired he be called after her long-lost husband. He would be baptized, in due course, at Holy Trinity Cathedral in the year 1877, as Sir John Franklin Herring. 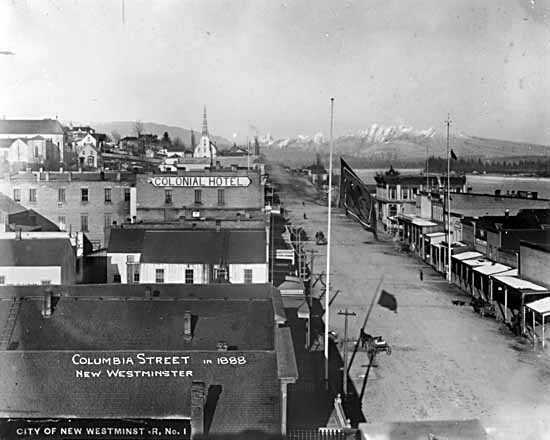 In November of 1859 citizens of New Westminster, as Queenborough was now called, expressed their concerns over the lack of regulation of land in the settlement. Catherine Lawless had relocated to the City following the loss of her Langley hotel by fire. At New Westminster she established the Mansion House hotel, situated on the wharf street four doors above the butcher Thomas Harris’ Queen’s Market. Sam Herring, removed from Whatcom, where he had once been among those complaining of squatters, found he was this time on the wrong side of civic decorum. Sam Herring had other business interests going on. Towards the end of 1859 he was listed as the Agent in New Westminster for the British Colonist newspaper. The population of the city and district at this time numbered not more than a hundred colonists, of those almost a third American, and it was still a very wild country for a man with a family. In May of ’59, the body of a man was found floating past the Revenue Station. The same day an Inquest was held, and the next morning a funeral, and the unknown man was taken away for burial on Annacis Island. In July the invasion of San Juan Island by American troops heightened anxieties of an outbreak of hostilities. In August, the watchman at the Donahue sawmill just below the city was murdered, and in October two canoeists on the Fraser came across the ghastly sight of a man clinging to the mast of a burning sloop, his partner shot to death. Sam Herring was a juror at the inquest for that one. In December, Edgar Dewdney was informed by Magistrate Spalding that Silpaynim, an Indian said to have been involved in several murders, was camped about 2 miles below the City, half a mile below the Saw-Mill. Dewdney employed a ruse of entering his camp as a friendly visitor before seizing the Indian and signalling for assistance from Constable McKeon and his men. Spalding informed the Governor that, as the Fraser River was frozen over, he requested the captive be held at the Engineer’s Camp—“to retain the prisoner in Military Charge until a passage is open to Derby.” Subsequently Silpaynim escaped from custody and attempted to cross the river on the ice. He fell into the frigid water and his body was later found downstream. As the city was built up with government offices, including a Custom House, the Revenue Service was removed to the north side of the river. Revenue Officer CS Wylde was granted a one-year lease to the old Revenue Station opposite the City, out of consideration for his wife and family. Wylde had no pretension to farm the land. He gave short notice to William Bevis to remove his house, and he immediately sublet to Samuel Weaver Herring. Pioneer farming was to be a new incarnation of Sam Herring. Herring was thirty years of age, an American from Maryland, USA. He had begun his working life as a river Pilot in Pittsburgh. He had been in California in 1850 first as a miner, and later operating a steamboat and a San Francisco Hotel. He next moved to Crescent City, California and came up with the rush of ’58 to trade in Whatcom. 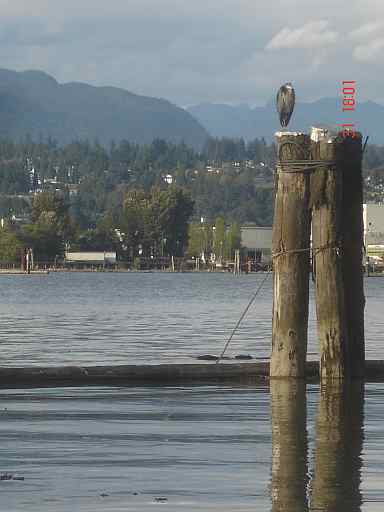 He had been in New Westminster since its beginnings on the riverbank. Herring’s family consisted of his wife Hannah, also thirty years old, and children Tillman, 4, born in San Francisco, Annie 2, born in Crescent City, and John, born at Whatcom. A son Henry would be born soon after their arrival, one of the first colonists to be born in British Columbia. The eldest son of John Herring also came up to New Westminster in 1859. Daniel George Herring, a painter by trade in Pittsburgh, was engaged in August 1860 to paint the outside of the Quarters of Colonel Moody at the Camp. The contract was completed with the assistance of his brother Samuel. Sam Herring’s parents John and Mary, on the breakup of Whatcom, went back to San Francisco and in 1860 were once again in the Hotel business, with but one child still living at home, Tillman R Herring, aged 12. Sam Herring soon established a prosperous farm on the south bank of the river extending from the old Revenue Station inland and along the river to the Indian houses. With Herring making significant improvements in cultivating the land at the Old Revenue Station, and other persons looking to take up adjoining acreages, CS Wylde, the primary leaseholder, wanted to secure rights to this investment. Herring’s aggressive development of the old Revenue Station property quickly ran him afoul of his neighbours and the authorities. On April 5, 1860, Colonel Moody complained to the Governor. Sir, I have the honor to inform you that in the execution of my office as Chief Commissioner of Lands & Works I caused certain posts to be put in the ground to mark the Boundary of the Indian Allotment on the left bank of the Fraser, yesterday afternoon. I notified this Boundary to the Indian Chief Tsimlana, and to Mr Wylde who rents the late Custom House which adjoins the Indian lot, sending the latter a trace of the ground . . . This morning the landmarks were removed and the Indian ground trespassed on by the erection of a fence. This I am informed by Tsimlana was done by a Mr Herring, a subtenant I believe of Mr Wylde’s. I should feel much obliged if you will cause legal steps to be taken to secure the protection of this Indian Allotment, and to aid me by such measures as may be in your power to prevent any persons whatever from disturbing landmarks or survey beacons established by Government Surveyors. Tsimlana is variously spelled Chimelanoch, Tsimlanough, and Zimlanoch—it is the name for a Musqueam Chief. The designation for Squamish Chiefs is Kuapeloch, or Capilano. A description of Tsimlana’s household at this time was recorded by the Anglican Bishop George Hills on his first visit to British Columbia. The issues raised by Herring’s encroachment were significant. Governor Douglas was very concerned to protect the interests of the Indian bands along the Fraser River, who often were in possession of the choicest properties for settlement: lands which had river frontage, which were “prairie,” or grass land, and which were often adjacent a creek, and surrounded by cranberry marsh. These attributes were the necessary means of survival for native peoples. Such spots provided fresh water, fish, good hunting (as they attracted game animals), fertile soil for growing potatoes, and fruit and vegetables, such as the natural onion-like camass plant, and the bogs were an indispensable source of medicinal plants. To a prospective settler, the key attributes were that the land was not timbered and that pasture could readily be used for grazing or for growing vegetables. For some decades, settlers would move in next to the Indians and begin to push them off their land. Douglas decreed that each band should say whatever their territory was, however big, and that it should be so marked off. The issue more pertinent to Moody was that his survey marks not be tampered with. This would render useless all the work his company of Engineers had set out to do, and would throw into disarray the settlement of the Colony. The full weight of Colonial law was brought to bear on Sam Herring and he was forced to sign an undertaking to save him from charges. “I Samuel Weaver Herring of New Westminster do agree with George Humber Cary Attorney General of British Columbia that in consideration of his desisting from filing an information against me in the matter of a contested boundary question I will not interfere with the land delineated on the right hand side of a red line drawn on the plan annexed herewith and thereon described as “Boundary” nor will I hereafter enter meddle with the same land or oust an Indian named Tsimlana therefrom. The plan attached shows the location and size of the Revenue Station building, the site of the boat house–which may have been removed to another location, as was common in those times—, a well for drinking water, and the Flag Staff. A large area is marked off on this property, probably Herring’s garden. On the far west side, is another house-site, likely the location of Bevis’ small residence. To the west of the boundary, lies the land allotted to Tsimlana, showing a large Indian house and another cultivated patch, and on the far west, some graves. Outside the boundary to the east are marked some more Indian graves. A second broader map marks the presence of a very large house further to the east. It is possible this was a Kwantlen house, as their presence was noted by at least one observer. The surrounding natural boundary shows the edge of the cranberry marsh. From the position of the graves and the natural clearing, it would appear that the Revenue Station had been established in the middle of an existing settlement. Herring must have been remarkably industrious in the morning following the survey, to construct the long fence shown stretching from the Revenue Station to close by the Indian House. It appears the function of the fence was to enclose the two garden plots, or at any rate to control his pigs. “the clear understanding between Mr Wylde and myself was that he should take the land for one year at a rent of L 20. He is not working at the land himself, nor employing labor on it; he has sublet it again for his own term of a year at a certain fixed sum. He would not therefore, if a lease were given him, lay out any money now in improvements, and I think it would be more just and reasonable that he should be content to abide by his original agreement till the year has expired. Hamley’s intention in granting Wylde the lease, was not to set him up as a landlord, but to allow him an affordable place of residence. Sam Herring was not sitting idle on his sublet land. Come harvest time 1860, he had a bountiful crop of produce that attracted admiration from a newspaper correspondent. Such laudatory assessments could only increase the value of the property, and attracted some interest. CS Wylde again requested an extension of his lease. He addressed his next letter to Col Moody, who would assume responsibility for the land in his capacity as Chief Commissioner of Lands and Works. “Having every reason to believe that the land I now lease from the Government, (known as the old Revenue Station) opposite New Westminster, will at the expiration of my lease (1 January 1861) be handed over to the Chief Commissioner of Lands and Works. Herring, for his part, decided to apply directly to the Colonial Secretary, to offer a lease, and to ask recompense for the value of his improvements, should his bid be unsuccessful. Herring had an even more pressing concern. He had written his letter December 24, but could not mail it until the 26th, when he added a PS. Herring was informed that the Chief Commissioner would be putting the land up for auction for a period of seven years. Sam Herring was also investing in the City side of the river, successfully bidding in December for three water frontage leases in Block 7 at Lots 11, 12, and 14, securing him his own wharf space. On February 8, 1861, Herring wrote a strongly worded letter to Col Moody demanding payment for his improvements at the old Revenue Station, and suggesting there was no law to permit Moody to auction land to rent. This last minute venting of frustration was perhaps exacerbated by pre-game jitters. The very next day, February 9th, 1861 was the day for the sale of Country Lands around New Westminster, and following that auction, the lease would be put up for bids. Moody’s Department of Lands & Works had gotten into a fine mess owing to unclear policies, lack of regulation and improper paperwork. Moody had first, in January 1860, forbid the sale of land opposite New Westminster for reasons of military security, reserving a huge tract of territory stretching from Annacis Island to Barnston Island and south to the frontier. In February he allowed that such land could be leased, but subject at any time to reclamation by the Government. 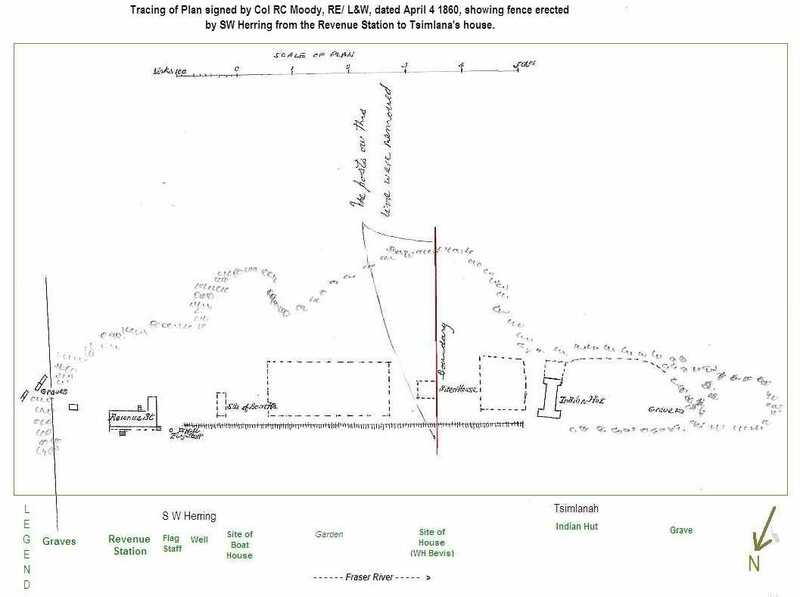 In March, the Governor opened up unsurveyed land for Pre-emption, and in April Governor Douglas instructed Moody to release surveyed land also, to be sold by auction. William J Armstrong was the second person to establish a farm on the south side of the river, about 2 miles downriver from Herring’s, where the flats met the headland. He first tried to lease the land, under Moody’s terms, and was wrapped up in red tape for almost a year. He afterwards tried to apply “Scrip”–a voucher issued by the Department of Lands & Works–in exchange for the land, also in accordance with Moody’s rules, and this too was disallowed. A number of other persons had applied to the local magistrate and registered purchases of land opposite New Westminster, with payment by land scrip—among them John Robson, Rev Edward White, and John Brough. John Robson went so far as to begin clearing land, to bolster his rights. But all claims were disallowed, since the law held that surveyed land could only be sold by public auction. The lots immediately opposite the city were included in the sections surveyed by Joseph Trutch in 1859, each half-mile squares. Outside the boundaries of the survey, land could be claimed by preemption. Moody’s Engineers produced a second survey of the highly coveted land opposite the city, dividing the riverbank strip into 14 lots, and it was these that were offered up at auction. Those who had claimed the land registered howls of protest. Having received a defence from the Commissioner of Lands and Works that all purchasers of land assumed a degree of risk, John Brough penned a scathing critique. At the auction John Robson bid successfully for the land he had claimed and begun to clear. But there was another catch. His Scrip could not be accepted as payment at the Auction, which was cash-only. The land was put up again and sold to Ebenezer Brown. After continuing protest at the unfairness of it all, the authorities allowed Robson payment for his improvements. Ultimately the twist of fate worked out well for both men: Robson, his mettle sharpened in his dispute with the powers that be, was led into a career as a newspaperman and thence into politics and the Premiership of British Columbia; Brown, a consummate capitalist, would assiduously develop the property, which became known as Brownsville, to the profit of himself and the district at large. White and Brough also received compensation for their losses, but the Land system would continue to be plagued with problems, not least that no allowance had been made for roads, and landholders to the back of the river had no access to their land. WJ Armstrong fared best with the Auction, his patience finally rewarded. No one bid for his claim and he could therefore successfully apply his Scrip at the upset price for unsold land. The lease would run from March 1st, 1861 to February 28, 1868. Wylde’s original one year lease had been for 20 pounds. He had offered an extension for 40, then 50 pounds. It is not known what he charged Herring to sublet during 1860. The value of the respective properties, as described by Moody, is puzzling. Lot A, the smaller parcel, had a significantly higher assessment of improvements, but was let for cheaper rent. In light of future events, it is worthwhile to note here the status of any improvements. In later correspondence concerning the properties, there is a copy of a lease purported to be for “Section A, Lot One, Group Two,” which was dated February 9, 1861. This is for the smaller parcel, at the yearly rent of one pound. With most of the surveyed lots being picked up by speculators, only three homesteads were being developed outside of the Indian village: Herring’s Ranche, the farm of Ebenezer Brown one mile downstream, and a further two miles down, the farm of WJ Armstrong. Sam Herring had invested in some cows, and in April of 1861 he announced in an advertisement in the British Columbian newspaper that he was selling “milk at 6 bits a gallon.” Son Tillman would accompany his father across the river each morning with his fresh milk and for many years after would be the city’s milkman. In July Herring entered into an agreement with butcher Thomas Harris to supply his shops with seasonal vegetables and fruit. Harris and Herring were old friends, having both started in business on Lytton Square in 1859. Two more engaging companions it would difficult to imagine: Harris the larger-than-life English sportsman with a love of story-telling, and Herring the eccentric, energetic, engaging American, both self-made men. Thomas Harris was making a great success in business since first opening his “Queens Market” at Queenborough in 1859. He dealt in cattle and held the lucrative contract to supply the Engineers with beef. He also had a shop in Victoria and soon after removed to Vancouver Island, where he would build himself the largest home in the City, race horses, and become Victoria’s first Lord Mayor. He left his mainland business in the hands of his step-son, Robert Dickinson, a success in his own right and a future mayor of New Westminster. Herring’s farm, self-styled “Herring’s Ranche,” was very visible on the south side for anyone travelling up the river, and once again attracted the attention of the Victoria press, which was always ready to put down the upstart colony on the mainland. A visiting writer decided to check out the local farms and found much favour when he took a canoe over to Herring’s. “On arriving there I met with a very kind reception from the well known proprietor and his good wife; the latter helped me generously to some excellent milk, to which I did ample justice. Mr Herring then showed me over his vegetable grounds, some 10 acres in extent, and I must confess that I never before witnessed such a striking proof of the richness of the soil in any country; the ground seemed literally to groan beneath the load of vegetation it produced. The same writer attempted to visit Ebenezer Brown’s farm nearby, and his description, though a trifle sarcastic, gives some insight into conditions along the river. “After looking over his grounds, at his stock, &c., and indulging in a parting cup of milk, I took leave of Herring’s ranch and its occupants, and returned to my canoe, when the idea struck me, that as Brown’s ranche was hard by I would take a look at it. I accordingly dropped down with the current, and landed on that ranche. After making my way with some difficulty through a slashing, or chopping, of some 20 chains, I was suddenly brought up at the edge of what appeared to be an impassible gulf. Whereupon I enquired of a siwash, who with his kloochman was ensconsed beneath a few shakes, where I would find Brown’s ranch. . . I learned that the high water in the Fraser had flooded back, and covered that portion of land under cultivation, which will, I fear, cause serious injury to the vegetables. A follow up letter to the paper railed against the bias and unfairness of the writer. While it is true that Mr Brown had only just begun to cultivate his land, Mr Herring’s “old established ranche” was, of course, less than two years old. Another visitor in September remarked that Brown had about 10 acres cleared and under cultivation, with “chiefly horticultural produce.” About two miles downriver, where the flats met the bluff, WJ Armstrong had cleared several acres and had his first crop of garden vegetables. James Kennedy, further down, opposite Annacis Island, had begun clearing for a plantation of fruit trees. The superior quality of produce on Herring’s patch was undisputed. For the next twenty years, his vegetables would win prizes against the best that Fraser Valley and Vancouver Island farms had to offer. The First British Columbia Industrial Exhibition was held in New Westminster, with a grand opening November 13, 1861. It was an opportunity to showcase the industry and agriculture of the young Colony. 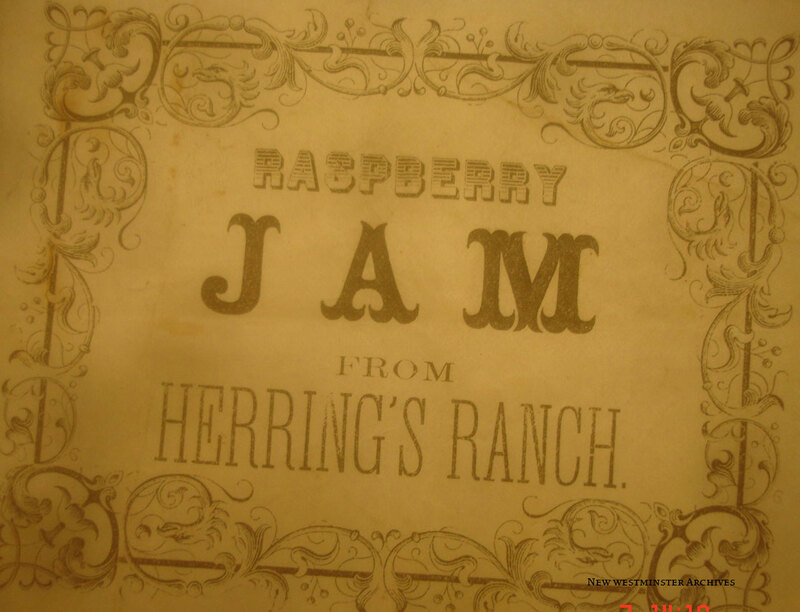 Among the various farms displaying their best produce, it was Herring’s that won the most prizes, including many firsts. With only his second harvest, Herring carried off prizes for an astonishing variety of products, including peas, beans, Indian corn, cabbages, kale, cauliflower, turnips, beets, pumpkins, squash, celery and rhubarb. His herb garden was without competition and garnered medals for Summer Savory, Bagold, Thyme, Mint, Margery and Sage. He took second place for fresh butter, and his wines were judge both best and runner up. That winter the Fraser River froze solid at New Westminster. Sam Herring took out an advertisement in the first week of January, when the ice had really set in, to assure his customers of a constant supply of milk. Tillman claimed that over the years he was never held back more than 24 hours, come ice or high water. By the spring of 1862, Sam Herring was sufficiently confident in the produce of his farm that he put in a bid for the supply of vegetables to the Royal Engineers Camp. The contract was for one year, and his offer was “2 pence half penny per pound.” Herring did not win the contract, but continued to find a ready market for his produce and milk among the residents of New Westminster. One local, in reminiscing about the year 1862, told a story about Herrings’ dairy. Sam and Hannah had another son born in 1862, whom they named Henry Holbrook Herring. Following a successful harvest year, Herring together with his father John Herring, formerly of San Francisco, branched out into business, purchasing the Mansion House hotel in the city. Mrs Catherine Lawless’s old establishment was located on the river front, near Harris’s wharf at Lytton Square. It was the largest hotel in the city with accommodation for 150, family and sitting rooms, and boasted two first class bowling alleys. Lawless had sold out in 1861 and removed to the Cariboo and the hotel was run for a short time by R Cameron. The Herrings had experience in the business, having run the Keystone Hotel in downtown San Francisco in the early 50s, and before that, a boarding establishment in Pittsburgh. John Herring’s wife Mary was a renowned hostess. Harry Guillod, a mining adventurer who spent his last few cents and his cap and jersey on a canoe ride down from Yale, arrived at New Westminster, the evening of October 16th, 1862. In this successful year, Sam Herring pre-empted 160 acres (Lot 26) on the south bank of the Fraser, eight miles downstream from his farm, at present day Ladner. Samuel Herring was in court again in December of 1862, but not on his own hook. He was a Juror in one of the more controversial civil cases of the time, and one which reflected well how justice was done in the early years of the Colony. It was a suit for damages by Robert Cranford against the packing outfit of GB Wright for the late shipment of goods over the trail from Douglas, at the head of Harrison Lake, to Lillooet. According to one witness, hundreds of pounds of bacon had been left some days, melting under the hot sun. Cranford and his brother had been put in jail for refusal to pay the freight bill. Public opinion was highly engaged in the case, and the courtroom was packed with spectators every day. Prominent lawyers were employed on both sides. Appearing for Cranford were DB Ring and JF McCreight; George Hunter Cary and HP Walker represented Wright. The presiding Judge was Mathew Begbie. Throughout the trial and following, in many columns of opinion in the newspapers, accusations of bias and unfairness were cast at both Jurors and Judge Begbie. After the trial, William Grieve, the foreman of the Jury, countered claims of bias and prejudgement on the part of some Jurors, with a claim of an opposing bias in Herring. This was the trigger for Judge Begbie to dismiss the proceedings. Judge Begbie was subjected to serious rebukes in the press for being biased and unfair during the proceedings, for his opinions and his handling of the evidence, and in ultimately dismissing the Jury. Begbie was notoriously impatient with Juries which did not agree with him, especially in criminal cases. Juries in the time of the gold rush were often loath to convict. In the trial of the murderer Neil, at Derby in 1859, Begbie had proposed keeping the Jury locked up without “coal, food or candle” until they could find the prisoner guilty. As well, Begbie had fallen in public esteem following charges of improper conduct in Cariboo land dealings. William Grieve, the foreman of the Jury, departed from points of law and fairness in a follow-up low personal attack directed at GB Wright and Sam Herring, both ex San Francisco men. This was a slanderous attack on Herring— who was no Ned McGowan—but by then perhaps he had his fill of courtrooms for the time being. New Westminster suffered a severe economic blow with the withdrawal of the Royal Engineers back to Britain in 1863. Sam Herring underwent some retrenchment in 1864. In May he sold his certificate of improvement for 160 acres at Ladner to Thomas Harris and his step-son Robert Dickinson. Dickinson ran a slaughterhouse adjacent to Lytton Square in the city, a few doors downstream (fortunately) from Herring’s hotel. In 1865 the telegraph line was pushed north from California, crossing the river to New Westminster at Brown’s farm. Another line ran from opposite the city through Herring’s property, heading east to Langley. A rough road accompanied the telegraph line putting Herring’s Point at the terminus of a route from Yale down the Fraser valley. The Indians had displayed some considerable savvy and courage in the capture, as Dunne was armed. Brew was pleased with the outcome. According to John Sheepshanks, the Anglican rector at New Westminster, there was another occasion when shots could be heard from across the river after a member of the Musqueams suspected of murder had been turned over to British justice. “The Musquioms were divided about this matter. It was old Tsimlanogh, the chief, a man who was always very friendly with the whites, who had given up the Indian to our people. Another party of the same tribe was much angered at this, and determined to have their revenge. Accordingly, they crept through the forest and began firing through the bush upon Tsimlanogh’s ranch. He and his sons returned the fire, and it seemed as if there would be loss of life. The Engineers, hearing the firing, sent an armed party across the river to protect an American family [the Herring family] that was residing there. The summer of ’67 saw Herring’s Ranche one again bountiful with fruit and vegetables. In a period of fine summer weather, the Methodist minister, Edward White, enjoyed a day on the river. Sam Herring and his father John Herring were running into some financial trouble dating from a mortgage taken out in 1865. Toward the end of 1867 they were unable to repay an indenture to the Government, in the person of JW Trutch, and were forced to give up their cattle for auction. Commerce was forced into a lull, but the residents took advantage and until the end of the month, when the weather moderated, there was skating every day on the river. 1868 was the year that SW Herring’s original lease at the Revenue Station would run out. Herring expressed some interest in discontinuing his tenancy there, petitioning the Government, through his MPP John Robson, that he be allowed compensation for his improvements on the land. Trutch played hardball with Herring, describing terms saying improvements “should revert to the Govt at the expiration of the seven years’ lease.” At the same time, he claimed he could find no records of the original agreements with Colonel Moody. “Died. On the 17th of September at Sitka, Mr Geo Daniel Herring, aged 42 years and eight months. Deceased was the son of John and Mary Herring, now residing in this City. He came to California from Pittsburgh, Pa. in 1850, and afterwards came to this Colony in 1859, and then emigrated to Sitka, where he died. Trying to resolve the tenancy on his long-held farm, Samuel Herring wrote to the new Chief Commissioner of Lands & Works, Joseph Trutch, regarding the lease conditions. Trutch offered an extension of the same lease held by Herring to 1868, plus a “portion of Lot 1, Group 2 lying between the said premises and Lot 2 in the same Group.” It appears Herring thus occupied the two lots of 14 and 18 acres, to the east of the Indian reserve, and now also the balance of land surrounding the reserve in Lot 1. Sam Herring was enterprising as always. In July 1869, it was reported “the sloop Martha, Capt Herring” was doing well making regular trading trips from New Westminster to the lumber camps on Burrard Inlet. “This case, which seems to have created considerable interest, was a claim for $100 damages caused, as alleged by the plaintiff, from the depredations of defendent’s cattle on a certain hayfield belonging to plaintiff, in which property in the form of hay and an aftergrowth of clover, were partly consumed and partly damaged. . . The same week, Herring was back in court again. He charged his neighbour Jim, of Tsimlana’s family, with pointing a firearm at him in a dispute over a buck. Herring had found a deer swimming in the river and had secured it by a line to his boat. The deer made violent struggles to escape and Jim and a “tillicum,” or friend, assisted by shooting the buck. For this help they claimed half the deer, but Herring refused. There are many accounts of the hunting of swimming deer, sometimes by design. It was a common practice of the Indians to use dogs to drive deer into the water where they could be more easily killed, and easily transported. Not more than two weeks later, a raft of disputes between Ebenezer Brown and Samuel Herring came up in court again. First, Herring applied for an appeal, with jury, of his earlier dispute with Brown. This was granted. Two more suits for damages by cattle, Brown vs Herring, resulted in judgments in favour of Brown. 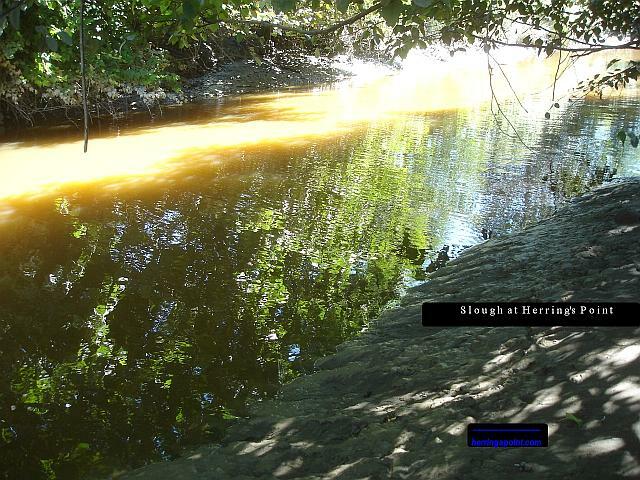 In a complaint by Herring against Brown, he alleged that Brown did damage to a bridge, said to be on Herring’s land. This case was not proven. Herring’s appeal of his first case came up three weeks later. The jury found against Herring and doubled the award of damages. The speed with which these cases were dealt with was typical of these times. A jury could be gotten together at the drop of a hat, and the court system often had the luxury of doing business without lawyers. One suspects that more that a modicum of theatre and entertainment value entered into the proceedings in the warmly lit courthouse, enlivening the dreary riverbank settlement. In December 1869 on one of his regular supply runs to Burrard Inlet, Sam Herring was caught in a gale off Point Grey and his boat was battered ashore, losing a third of its cargo. The same gale blew down chimneys and sheds on the wharfs along the New Westminster waterfront. The first week of September 1870, a sturgeon, said to be the largest ever caught in the Fraser River, was hauled into a net off Herring’s Point. It measured 11 1/2 feet long and tipped the scales at 784 pounds. Sam Herring again was noticed by the press for the quality of his exhibits at the Annual Show of the Agricultural & Horticultural Society in Victoria, Vancouver Island, in the last week of September, 1870. In the last week of November, the lower Fraser district was again rocked by high winds which damaged properties in the City and blew down Ebenezer Brown’s new barn across the river. In time for Christmas, 1870, Sam Herring expanded his business and farming interests with the sale of his “native wines” in Victoria. 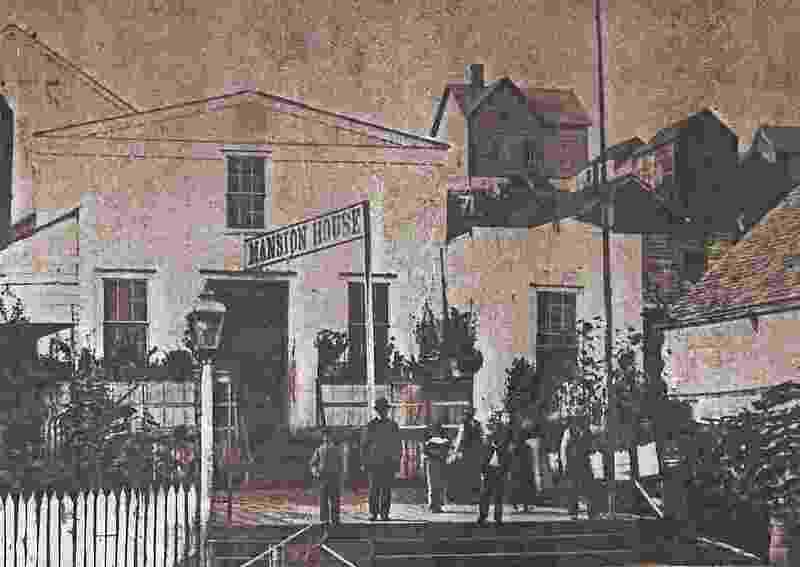 The Herring family were to suffer a serious setback when on Feb 9, 1871, their landmark hotel The Mansion House, which they ran as a boarding establishment, caught fire. Mrs Herring related that some guests had arrived hungry and cold late in the evening, when dinner was long over. Among them was Jason Allard of Langley. Mrs Herring, anxious to provide hot food and hot water, attended to her guests’ needs. Sometime after midnight, Mrs Herring aroused the house with cries of “Fire! Fire!” Some of the boarders rushed to the kitchen and attempted to quell the blaze, and could have gotten it out, if a supply of water had been on hand. They had to flee when the flames could not be beaten down. Although located just a short distance from the water hoses of the Hyack Hall, the entire building was destroyed. The prompt appearance of the fire crew prevented the flames engulfing the boardwalk and neighbouring buildings, including the Telegraph Hotel. The two grandsons, Charles and James, who were staying with the Herrings, were children of their daughter Eliza Susan, Samuel’s younger sister. Samuel Herring and his son Tillman were both active members of the Hyack fire brigade. Victoria Day was the grandest of festivals in the Lower Fraser, and always included Indian 21-man canoe races, and boat races. Sam Herring was a skilled boatman and a perennial competitor in the sailing race with his sloop the Martha. This year he lined up against such as Aleck McClean’s Coquitlam Lass, and Gossett’s Flat Iron. The Martha established a big lead, before capsizing. Earlier, his boats had won the four-oared race, and that for two pairs of sculls. British Columbia joined Confederation in 1871, but Dominion Day passed in New Westminster with little notice. After experiencing a succession of relatively mild winters since the great freeze-ups of 1858 and 1862, British Columbia residents were taken aback by the severity of frost in late December 1871. Travellers from upcountry made their way in canoes through the ice as far as Matsqui, where they were forced to take to the trail. “This so-called trail,” reported the Mainland Guardian, “is simply a long opening in the forest where the trees, instead of being upright, are horizontal.” It was arduous travel in the best conditions, and downright dangerous in the winter. Among those who braved hardships and exposure to make this trip was Arthur Bushby. This was Bushby the Magistrate, before whom Herring had appeared on many occasions. A Mr Hill, arrived with feet frostbitten and remained some days at Herring’s to recuperate. The trail upon which they travelled was the “New Westminster and Yale Sleigh Road.” Constructed with the telegraph line in 1865, it existed partly for just such emergencies, when the river was impassable. It had ambitions to being a cattle road, but was poorly maintained. 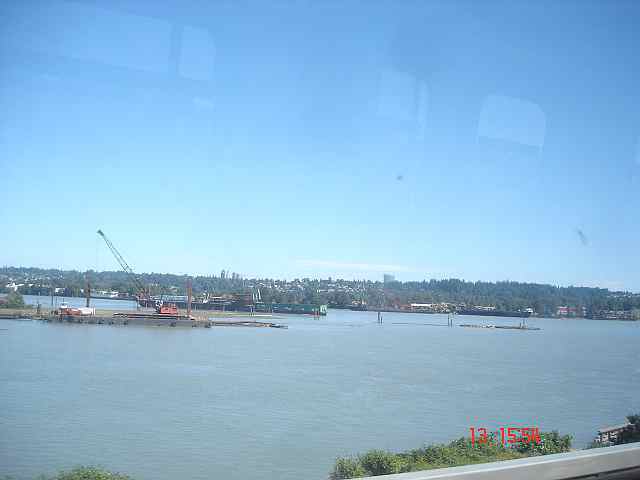 It began opposite New Westminster in the vicinity of Herring’s farm and followed the river, before rising to the heights opposite Tree Island (present day Port Mann), and heading toward Barnston Island, where from this point eastward to Langley, remnants can be travelled even to this day. The cold weather persisting, many others were forced to take this route to New Westminster. Another party of eleven came down in two groups. The first four reported a “most disagreeable trip, alternately on the ice and on the trail.” They arrived at Herring’s on Sunday night and crossed over on the ice Monday. In the Journals of the British Columbia Legislature for 1872, there is a reference to a petition of Samuel Herring that was referred to a Select Committee. The purpose of the petition is not stated, although Herring may have been asking to purchase the land he occupied. The committee was instructed to determine if the land was reserved, whether Herring had a lease to 1878, whether the land was surveyed, whether the Province had the power to sell the land under the Terms of Union, and finally, if there was any rent due. The Committee reported it had examined the lease dated 29 May 1868 between JW Trutch, Chief Commissioner of Lands and Works and Samuel Herring. The committee concluded that “the subject matter of the petition is wholly out of the power of the committee” and must be resolved by the parties to the lease. It is possible the Committee did not return this lease to the Department, as later correspondence would show it could not be found. The produce of Herring’s farm continued its run of success in competition. In October 1872 the First Provincial Agricultural Exhibition was held at Victoria and Sam Herring went over and carried off an armful of prizes. The list shows the variety and quality of the produce on the land along the river opposite New Westminster. Collection of fruits (apples, pears, melons, plums) grown by one exhibitor, 2nd place. Herring also kept livestock on his farm, notably pigs and cattle, and he had at least two oxen, useful for clearing and tilling. 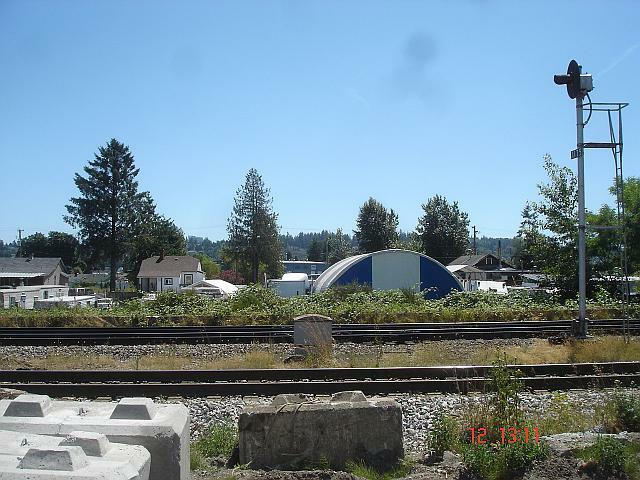 Sam Herring, along with some significant other businessmen in New Westminster, found themselves in difficulty after investing in a speculative agricultural enterprise on Lulu Island. The Fraser River Beet Root Sugar Co. in July of 1873 was taking Herring to court, claiming he should pay a share of the losses. Money troubles may have also resulted in Herring’s appearance in Court yet again before Mr Bushby. He was ordered to pay an overdue note owing to Mr Fisher. The Electoral District of New Westminster, outside the City proper, ranged from Ladner to Chilliwack and included Burrard’s Inlet. For the election of 1873, there were just 5 polling places in this entire region. One at Granville, one at Ladner, one at Chilliwack, one at Fort Langley, and one at Herring’s Farm. A road was under construction from Brownsville, where Ebenezer Brown had built a wharf, to Semiahmoo. From the top of Brownsville hill, a second trunk road was underway to Sumas Prairie, thence onward to Hope and Yale. The newspaper reported them to be “mostly of an inferior character, and consequently no buyer offered.” At a time when only agricultural land held value, the forested district which is now a City Centre could attract not one dollar an acre. 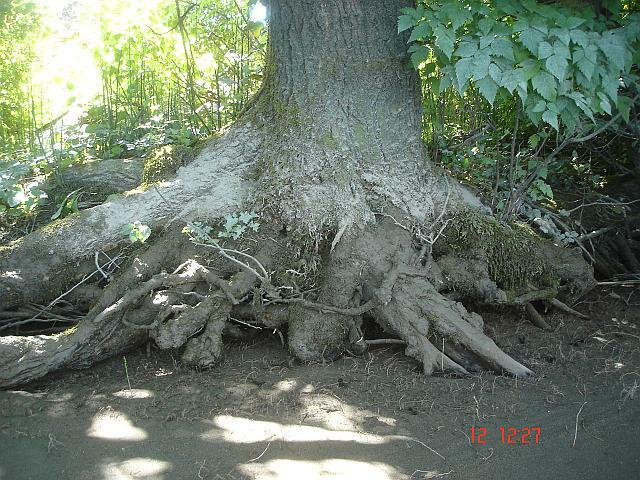 SW Herring picked up a small parcel of land on Lulu Island fronting on the North Arm, Lot 20, B5N R4W, 27 acres. The cold persisted and on their return home the Cudlip’s “crossed the river on the ice.” The Fraser quickly froze to more than six inches and there was “fine scating” well into the month of February. Herring’s parents, John and Mary, were at this time residing in San Francisco, where they celebrated their 50th wedding anniversary, the invitations printed on gold-embossed cards. By the mid-seventies, many fine farms had been developed in the Fraser Valley, notably down at Lulu Island and Ladner’s, and upriver at Chilliwack. Nevertheless, Herring’s Ranch continued to garner acclaim in the autumn of 1875, carrying off a fifth of all the prizes at the Agricultural Exhibition. Sam Herring won for, among other items, ducks, cattle cabbage, onions, corn, cucumbers and cooking apples. The Fraser River reached flood stage again in June 1876. At Soda Creek on the upper river the water rose 12 feet in one day. Temperatures in the Canyon reached from 98 to 106 degrees Fahrenheit and in the lower Valley 82F. Residences and farms throughout the Fraser Valley were inundated, leading to some complaints from Herring’s farm. In 1876 the Governor-General paid a famous visit to New Westminster and after meeting dignitaries and engaging in ceremonies, His Excellency’s party headed to the steamer Royal City, when they chanced to meet up with Sam Herring. Official ceremonies and meetings continued late into the evening, but late as it was, the Lord and Lady weren’t ready to retire for the night, slipping away to their meeting with Sam Herring. “We then prepared to go out fishing, and, conducted by ‘Mr Herring,’ we had settled ourselves comfortably in the boat, when ‘Mrs Herring’ was announced, and we had to make room for her; she proved a most talkative lady, and, in the language of the country, “clouch tum-tum’ was the burden of her song. The ‘beautifulness’ of various fishes and dishes occupied her whole mind, and to the Commodore of one of Her Majesty’s fleets, she enlarged with fervour upon the merits of a particular bit of fat in a particular place in the inside of a particular fish. The Royal City she likened unto the Garden of Eden, only giving the preference to the broils and the stews, the currant wines and the potted salmons of the Westminster Paradise upon earth. In the 1870’s a number of canneries were built on the Lower Fraser River, and Samuel Herring participated in the fishery. 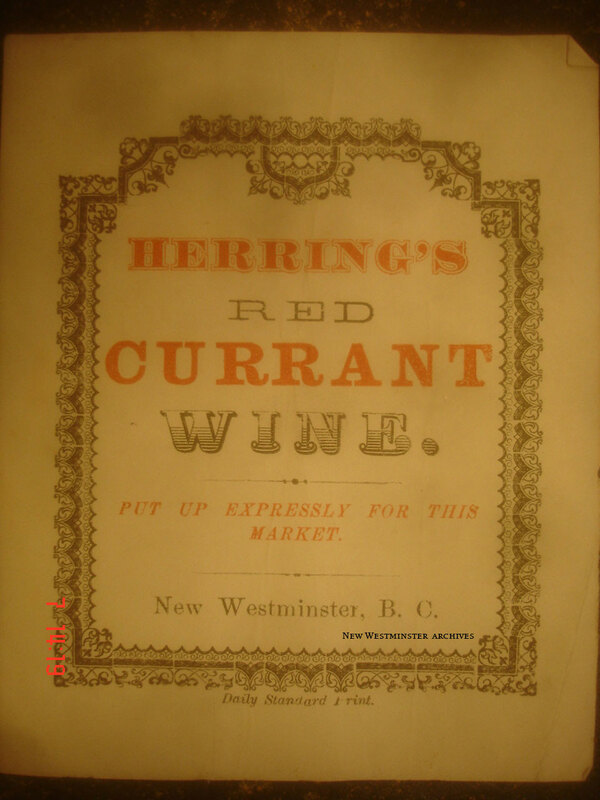 In the Guide To British Columbia for 1874 there is a large advertisement for “Herring’s New Salmon Curing and Canning Factory.” The term “curing” suggests this was salted fish, a process that preceded the modern canning method. 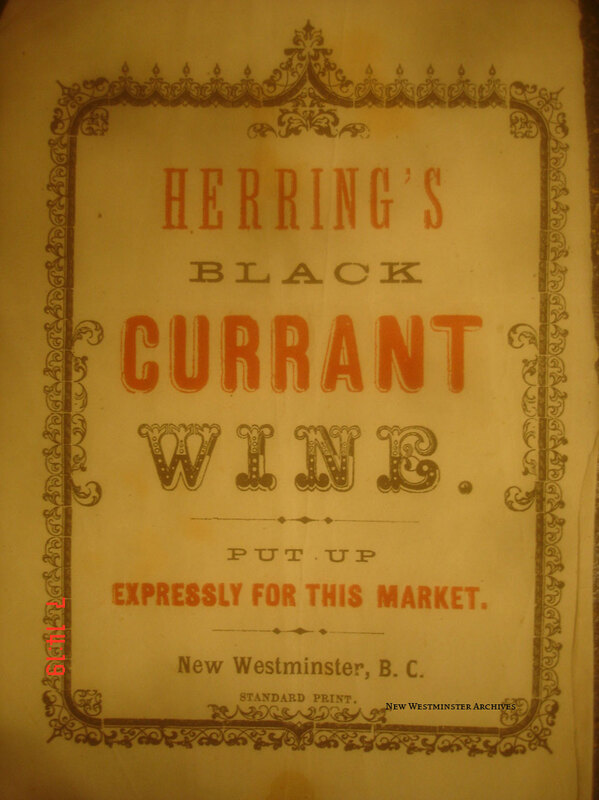 Herring also ran his “Fish and Game Market” at New Westminster. He offered venison, geese, ducks, snipe, grouse and all kinds of fish and sea-food from sturgeon to oysters and clams. On July 14, 1877 it was reported that he caught 2100 salmon in 24 hours. Sam and Hannah’s sons were also involved in the fishery. When left in the lurch, Sam Herring felt his only recourse was to withhold payment, the contracts not having been fulfilled. This resulted in his being summoned in suits brought against him for unpaid wages. In the August heat, and with the fish running, Herring’s frustration boiled over in court. He interrupted proceedings several times and was ordered from the courtroom. He resisted being escorted out, and Tillman Herring, knowing his father was suffering from ill health, came to his aid, assaulting the officer. Both Herrings were reprimanded by the presiding magistrate. Sam was fined $20, and Tillman, third-man in, was given a stiffer sentence, serving two weeks in jail for his offence. Notwithstanding Sam Herring’s difficulties as an employer, he long enjoyed a close relationship with natives who were his neighbours and who for had for many years supplied his shop with his stock in trade: fish, game, oysters, and wild fruits, which they gathered near and far. It was a complex supply chain and entailed an intimate knowledge of sources and timing to bring each item to the kitchen tables of New Westminster and Victoria. 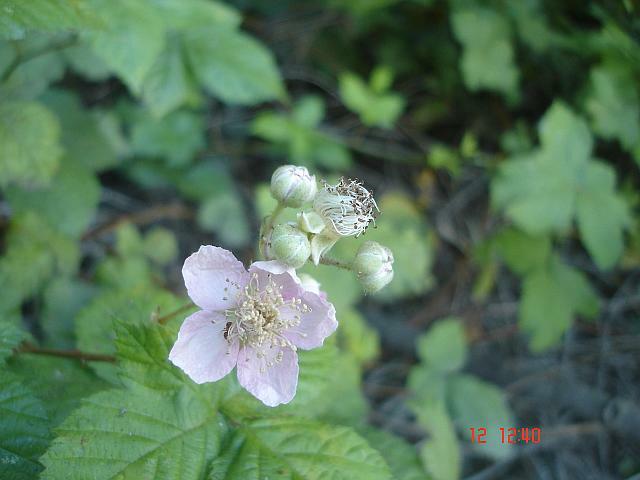 Oysters and clams came from Mud Bay and Burrard Inlet; game from the hills above Brownsville and beyond; wild blackberries, blueberries and cranberries from secret patches on hidden prairies, their locations jealously guarded even from other natives. Sam Herring, early in business, had tapped into the intricate survival and trading network that had sustained native families for generations. For his part, he was renowned for prompt and reliable delivery of fresh goods, which he advertised to every household. Herring was involved in another minor dispute with fellow pioneer Alex McLean over damage to a fishing net. Herring abandoned the suit at the courthouse. Opening just down river from Herring’s at Brownsville was the modern and spacious facility of the English & Co Cannery. A description of the cannery appears in the Mainland Guardian of August 11, 1877. The cannery industry had transformed the waterfront on the south side of the river. The land hitherto the object of great efforts of clearing and cultivation for the produce of the soil, was being taken over by mammoth buildings, wharfs, and machinery. In equipment alone the investment was huge, with steamboats, sail-boats, nets, and a plant on-site to manufacture the cans, the nets and the packing-cases. The cannery being powered by steam, there were separate engine and charcoal houses. At the height of the salmon run the cannery employed 50 Indians, 250 Chinese and 50 white men. The Indians camped along the river, and the Chinese and whites were put up in boarding houses, not far from the cannery. “SW Herring puts up 75 barrels of salmon a day . . .
English & Co, at Brown’s Landing, is the largest cannery on the river, and at present about 300 hands are employed by it. Two small steamers—the Leonora and the Leviathan—are at present employed in collecting the fish from the company’s boats, and bringing them to the cannery. The booming fishing business brought scrutiny from the public over concerns for the prudent use of this resource. There were complaints of over-fishing, dumping of offal into the river, and even waste of fish. 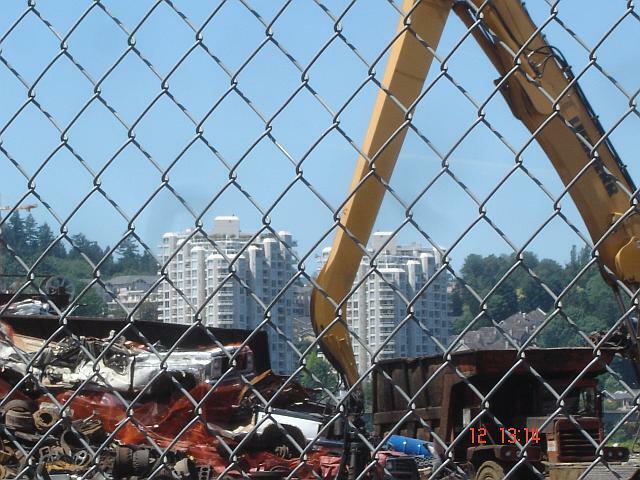 In response to the concerns expressed by the public, the Inspector and those involved in the fishery, the stakeholders came together in December in New Westminster. Samuel Weaver Herring, Marshal Martin English, Henry Holbrook, James Wise, Alex Ewen and Peter Birrell, acting as Secretary. English’s proposal for the building of a “breeding establishment” was not forgotten, nor the means to pay for it. His proposal for a license fee of $20 on every fishing boat, and a duty on packed salmon was also accepted by all present. 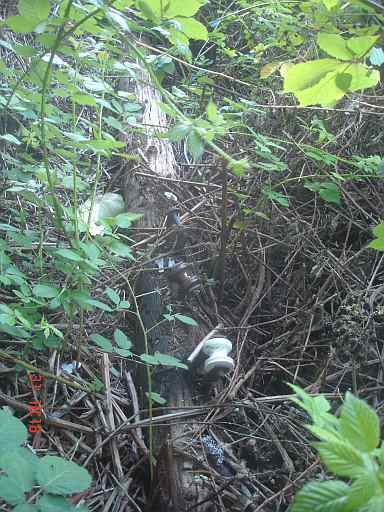 The meeting also agreed to the need for a boat to remove snags from the river, which entangled the drift nets. All these recommendations would come into effect in the coming years, most notably with the construction of the Dominion Fish Hatchery— a development which tragically cut short the life of the Fishery Commissioner. Anderson was out at Pitt Lake in late 1883 searching for a location for a hatchery when his small steamer ran aground in the shallows and he was forced to stay overnight with wet clothing and without blankets or fire. His health suffered and he died in the spring , never seeing the completion of the hatchery at Bon Accord in 1884. A smallpox outbreak struck New Westminster in 1877 and the Herring family took in some children for care, for which they received compensation, but not without litigation over the amount. Continuing his run in the courts, another suit was brought against Sam Herring in October. Hung Yuen won a judgment in Victoria in payment for vegetables supplied to Herring. SW Herring was a long time member of the Hyacks, and in 1878 he made an unsuccessful run for the top job in the Fire Department. Even when not involved in personal disputes, Sam Herring’s name was never far from controversy. In a raucous sitting of the Legislature on March 1st, 1878, insults and charges of patronage were hurled across the floor by WJ Armstrong, directed primarily at turncoats Ebenezer Brown and Robert Dickinson. He alleged that since switching their support from the Walkem administration to Elliot’s, they had benefited from Government patronage. Such a noble defence by the Honourable Mr Fisher brought “Cheers” from the Government bench. Herring employed the services of the steam propeller boat Georgie for the fishing season, but Sam Herring was by late 1878 in failing health. His family rallied. In March 1879, Mrs Herring opened up the “Palace Restaurant & Oyster Saloon” on Front Street, New Westminster. She advertised meals at all hours. Sam would be in charge of the bar, dispensing the best wines, liquors, ale, porter, cider and cigars, “carefully selected and will give general satisfaction.” It was a return to Hannah’s role as hostess, and Sam as host in his own public house. Sam’s eldest son Tillman was also making a return to the family business. At the end of July, he reopened with his brothers John and Henry the “Original” fish and game market on Front Street, two doors above Begbie Street. A ferry, the Nellie Taylor, Capt Thomas Penny, advertised regular transport to the canneries and picnic excursions to sites along the river, leaving from “Herring’s Slip,” Front Street. Across the river, as a new municipality was being incorporated, the rough and ready pioneering era came to a sudden closing. Herring’s obituary in the Mainland Guardian noted that he had been in failing health for some time. He was 49 years of age. “The death of Mr Samuel Herring—On Friday evening last this community lost one of its remarkable men, one who will long be remembered for his eccentricities, if not for the valuable work he has done in building up this city of ours.. .
he leaves a widow, who is generally respected for her industry, and devotion to her four children. . .
With all his peculiarities, he was generous and hospitable, and his wonderful energy and enterprise created for him many admirers, who will sadly miss him.. .
His longtime neighbour, fellow Mason, and sometime adversary, Ebenezer Brown, arrived back from a trip to England a few days too late to attend the funeral for Sam Herring. 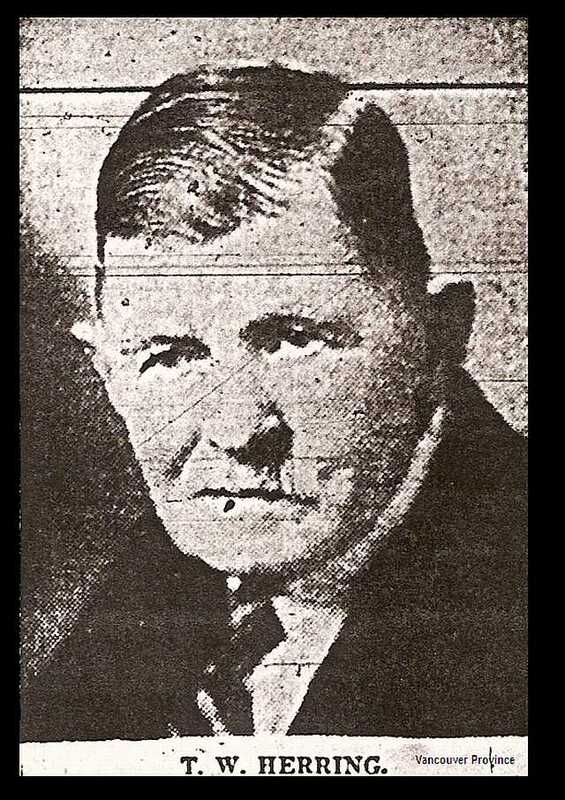 Mr McLennan did not last long in the Bar, and in June was replaced by Mr Frank Mathews. The first month of 1880 was chosen for a marriage of the 22 year old daughter of Samuel and Hannah Herring. Miss Annie Mary Herring, born in Crescent City, California in 1857, a toddler at boomtown Whatcom in the heady days of ’58, and resident on the Fraser since 1859, was married at New Westminster to accountant James Gerald Jaques, a native of Quebec, on Jan 12th. By 1885 they would be living on a large property (lot 13) on Clinton Street (2nd St) and Queens Avenue. They would remain childless until the adoption of a daughter, Alvie, born July 15, 1887. Other notable passages in the Herring family that year included the birth, on April 4, of a son to Tillman R Herring in San Francisco. In June, Samuel’s other younger brother, Thomas A Herring, born in Pittsburgh, died aged 34 years in Mayfield, California. Thomas had been living many years with his widowed sister Angeline, who had married Albanus Rowley one of the founders of Alviso, CA. Ageing parents John and Mary, in their late 70s, also resided some years in the same household. In December 1881 a daughter was born to Sam Herring’s youngest brother, Tillman R Herring, in San Francisco. By this time Tillman W Herring had since closed up the market in New Westminster to return to the river boats. It was a phenomenon that would occur with increasing frequency in the next couple of decades, with increasing settlement and clearing of land, never failing to prove a cinematic attraction to residents on the hillside in the City. On June 5th, a day of heavy rain, the citizens of New Westminster were shocked when Ebenezer Brown fell dead at 4 in the afternoon. Since joining Sam Herring on the south side of the river in 1861, Brown had taken advantage of the location of his farm to put his stamp on the development of the lower Valley, become wealthy through his business dealings, and as a populist politician and staunch champion of the Mainland, won every election he ever contested, as a city councillor and provincial legislator, not forgetting his entertaining disputes with Sam Herring and his commanding officer in the Militia. Brown’s daughter Eugenie and son-in-law JS Knevett would return from England to manage his business affairs. Of the Herrings, was the turn of youngest brother Henry Herring to run the old stand on Front Street. He reopened the store in November 1883 and advertised “fresh and salt water fish, game (including venison), cranberries, vegetables, etc.” As with his father and brothers, he offered a wide selection of natural products and household delivery. In December 1883 newspapers in California and BC reported the death of John Herring, of San Francisco aged 79 years, 9 months. 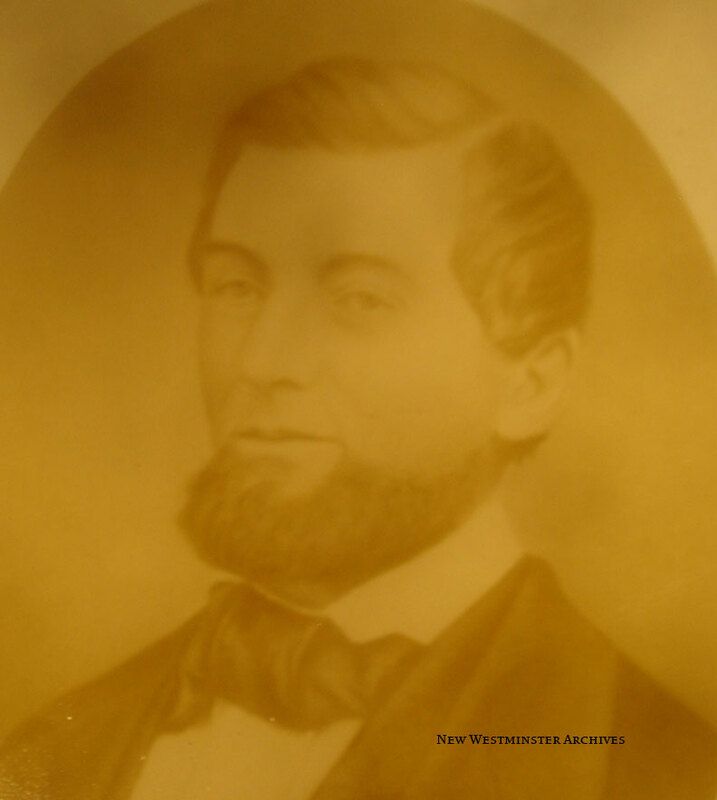 A native of Maryland, Sam Herring’s father had come out to California in from Pittsburgh in 1850 and had spent many intervening years in the northwest. 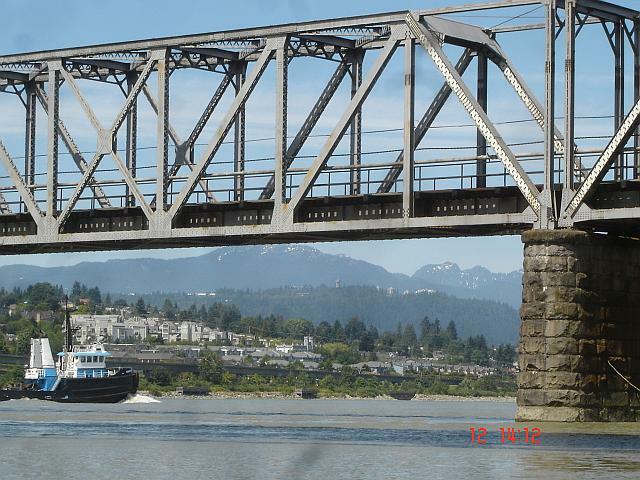 In March of 1884 a regular ferry service, the steam paddle-scow K de K, began crossing the river from New Westminster to Brownsville Landing. Prior to this time travellers had to bargain with Indian canoeists, or request ferrying by such as Sam Herring. In 1885, Samuel Herring’s widow Mrs Hannah Herring applied to the Ministry of the Interior, which held jurisdiction over lands which fell within the Railway Belt, regarding her status and possible ownership of the land on which she had lived for 24 years. This lease was the one which had been signed by Trutch himself, in an earlier capacity, and which subsequently had been reviewed by a committee of the legislature. There is some irony is Trutch’s promotion of the Reserve. In his first land survey of 1859 he had not even included the presence of Indian houses on his map. In later years he worked to reduce the size of reserves allotted under the authority of Governor Douglas. Proceedings were taken to eject Mrs Herring from the land in 1886, but they were stayed. 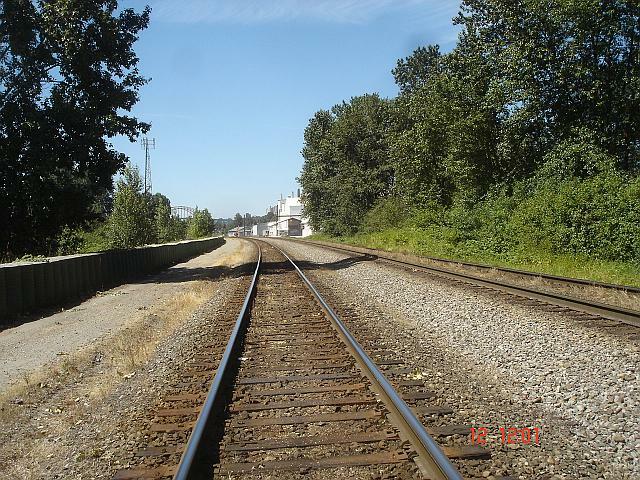 The value of the land had increased considerably, as it lay at the northern terminus of the proposed New Westminster Southern Railway, which would run to the border, thence to Fairhaven on Bellingham Bay. Tillman Willard Herring continued with his brothers in fishing and fish marketing. The Dominion Fisheries return for 1885 records “T Herring & Co” selling 10,000 fresh salmon. He also handled 50,000 pounds of sturgeon. Among fishes in lesser quantities he sold 1,500 pounds of fresh herring. In the last few days of 1885 came the news from San Francisco of the death of another New Westminster pioneer. Mary died two years to the month after her husband John Herring. John Franklin Herring, the youngest of Sam Herring’s boys, was up the coast at Essington in 1886 and served as a Special Constable with Superintendent HB Roycraft during the Indian protests at Metlakatlah. He would remain there many years, involved in the burgeoning north-coast fishing industry. Hannah Herring continued the struggle to maintain her tenure on the site of the old Revenue Station. Mr J Jaques of New Westminster, in presenting the case of his mother-in-law to Edgar Dewdney, Minister of the Interior for the Dominion Government, in 1889, remarked on the history of the adjacent Indian reserve. It is evident from correspondence, cited earlier, of Governor Douglas and Colonel Moody, that the lessee of this land should have a right of purchase, should the land no longer be required for a Government Reserve. But the Governor and the first Chief Commissioner of Lands and Works, were long gone, and each decade brought new personalities, covering the past as effectively and deceptively as the silting of the Fraser laid down fresh sandbars. The letters, the maps, and the leases appeared to be unknown to later officials. In this respect, the Herrings suffered the same fate as the Indians, with the clearest of instructions covered by layers of re- and misinterpretation. In the first week of 1890 the Fraser River was covered with ice all the way down to Ladner at its mouth. The old ferry was the K de K, the steam scow that had been transporting people, horses and wagons, cattle, and other freight across the river between New Westminster and Brownsville Landing since 1884. The service was barely adequate at the best of times, and during freeze-up could not operate. There was a swell of support among the citizens of New Westminster and the towns of the lower Fraser, for a more efficient ferry system, or a bridge across the river. A ferry would be built and go into operation in 1891, but a far greater change was in the offing. 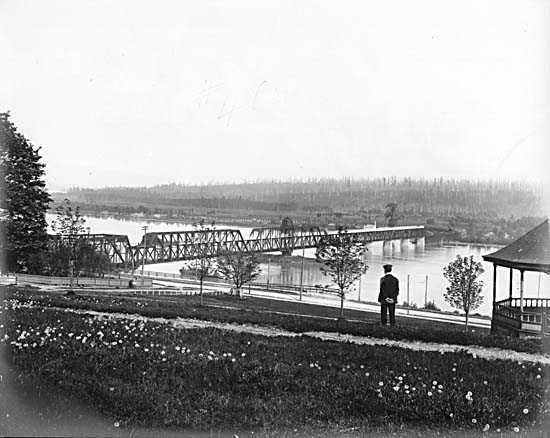 A railway, first promoted by Ebenezer Brown as far back as 1883, but held up by federal government policy favouring the Canadian Pacific Railway, was finally under construction to connect New Westminster with cities in Washington State. The line of the road ran from the border at Blaine, through Hall’s Prairie north to Port Kells, and west along the riverbank, terminating opposite New Westminster. After some initial financing difficulties forced the withdrawal of the developer, American retired Senator Eugene Canfield, a contract for constructing the railway was signed with noted builder Nelson Bennett, of Tacoma and Fairhaven. Unlike his predecessor, who had more interest in real estate booming than construction, Bennett and his partners declared their interest was “straight railroading.” They saw the line as part of network connecting the US and Canadian transcontinental roads. Bennett had close ties with JJ Hill of the Great Northern Railway, and on completion this road would be operated by that company. With the injection of new capital, orders were put in for locomotives and steel rails. At camps along the line upwards of 400 men at a time were employed blazing, clearing, grading, and building bridges and trestles. Two vessels laden with rails, the Cordelia and the Astoria, set sail from England, destined for the Fraser River. The Cordelia left Liverpool the first week of February, carrying 1500 tons of steel rails with a crew of 14 under Captain Owens. The Astoria left Maryport on the February 24. She was laden with 2,142 tons of rails with a crew of 25, Captain Hugh Dagwell. 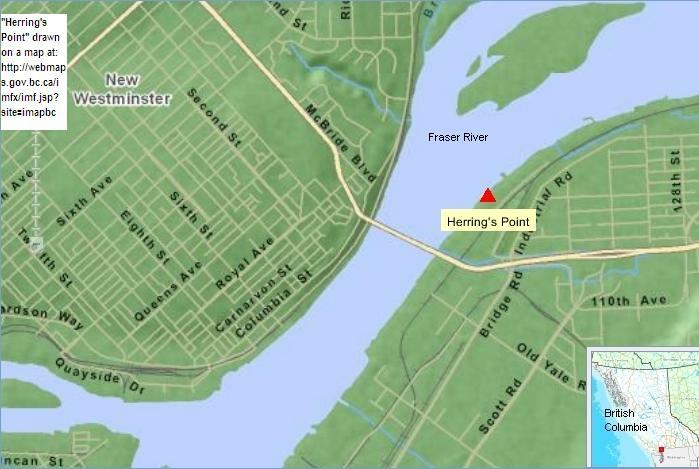 The site selected was at Herring’s Point. A wharf was constructed, 740 feet long, and laid over with double thick planks to receive its load of steel. The cargo was found to have remained in place as stowed, but the remainder of the ship required a thorough refit. She would remain at the Falkland Islands for almost three months. At Herring’s Point the first of June came and went, with no sign of the ships bearing rails. Work progressed at the same pace on the US side towards Fairhaven. In the last week of July, word reached New Westminster that the Cordelia had entered local waters and was proceeding up the river under tow of the tug Active. Crowds lined the city wharves waiting to catch a glimpse of the tall ship. She did not pass up to Herring’s Point until 11:30 at night. The Daily News Advertiser of Vancouver reported her arrival. The Cordelia would remain nearly a month while unloading. Francis Yorke of Moodyville took on the task of unloading the rails upon the wharf. His work was finished August 8, and after taking on some gravel as ballast, the Cordelia slipped across the river to the Royal City Planing Mills to take on a load of lumber bound for Valparaiso. 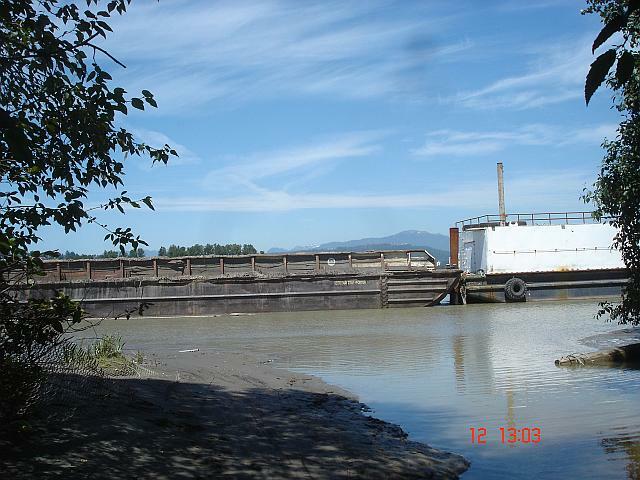 The Cordelia remained at the Royal City mills until September 16, when she was pulled downriver by the steamer Active, with a cargo of 500,000 feet of lumber, cut from trees harvested on the vast Mud Bay and Kensington holdings of the RCPM. As the summer dragged on into autumn, there was still no sign of the Astoria. The antiquated ferry K de K, continued to chug across the river on her hourly trips, but a new modern ferry was in the works. The railway locomotives had arrived from Winnipeg. Engine 199 went down to Fairhaven by the steamer Purdy to start work on that end, and Engine 202 was put to work over at Liverpool pushing track and supplies along the line. Towards the end of September, a note appeared in the paper that work on the railway had been suspended pending the arrival of the Astoria. After undergoing an extensive overhaul lasting almost three months, the Astoria had sailed from Port Stanley. Rounding the Cape she ran into another fierce storm. She was reported seen off the coast of Chile looking battered and dismantled. The rest of her voyage up was without incident until approaching the entrance to the Strait of Juan de Fuca she experienced strong north, northeast gales. After sighting Cape Flattery she was blown back 30 miles out to sea by a strong southeasterly. There she signalled the tug Wanderer and was taken under tow to Port Angeles, on the 20th of October. She was brought up the Fraser under tow of the tug Lorne, Capt Christenson. Drawing 20 feet of water at half-tide, the Astoria went up past the Sandheads with plenty of room to spare. This was no insignificant feat, for the navigation of the Fraser River had often been called into question by rival ports. The Astoria was heralded as the most important vessel in terms of tonnage and draught yet to go up the river, drawing two feet of water more than any previous vessel. As she came near New Westminster, the whistle of the Lorne brought excited throngs of people to the waterfront to watch the long-awaited Astoria glide past. Those who watched from the hill at Albert Crescent took in a fine view of wharf and the new Southern Hotel just completed at Liverpool terminus, and now open for business, under the management of Mr Burd (“Budd”), a veteran of the Nile Expedition. Tying up to the wharf at Liverpool completed a trip that had taken, with the stop-over in the Falklands, at total of 245 days. The actual time at sea was a moderately fast 135 days. Coincidentally, a truly fast ship was in New Westminster at the same time. The Titania, loading lumber, could make the same voyage in 104 days. At Liverpool the next day, Captain Hugh Dagwell, who had spent the night in a hotel in the city, took over an armload of mail for his crew, the first they had seen since leaving Port Stanley three months before. Then he sat down to recount the voyage to eager reporters. By the second week of November the Astoria had disgorged nearly all her cargo, and the entire 740 foot long surface of the wharf at Liverpool was laden with steel rails to a height of four feet. Stevedore Yorke had been given 21 days to unload, and this he did with time to spare, including two days loading her up with 200 tons of gravel ballast brought down from Port Kells. On November 14 the Astoria would leave the vicinity. Before she left, the new ferry steamer Surrey was launched into the water. Track laying began again in earnest, and by the end of 1890 the railway line was complete to the border. The first week of the new year railway magnate Nelson Bennett pumped a hand-car 18 miles from Blaine to Liverpool. It was at the wharf at Liverpool that the most auspicious events of the new year 1891 would transpire. On February 9, 1891 the American songstress, Emma Juch, and her English Operatic Company gave a “Grand Dedicatory Performance” to open the Vancouver Opera House. She gave two performances the following day, and was scheduled to perform in Fairhaven the next day, skipping the Royal City. It was a telling reminder of how Vancouver had eclipsed New Westminster as the premier town on the mainland. Ms Juch passed through New Westminster on the 11th of February and her entire entourage—including an owl, in a cage run up on the mast–embarked on the steamer for Liverpool. A pity. As it was, the company landed at Liverpool with no time to lose on their way to Fairhaven for a performance that evening. While it was the “little warbler” who christened the railway with its first paying customers, it fell to the wife of the Lieutenant Governor to give a formal dedication. Valentines Day was the date chosen for the official opening of the line to Fairhaven. TJ Trapp, a director of the railway company, and a principal in the “Liverpool Land and Improvement Company,” presented Mrs Nelson with a deed to a corner lot in the new city, and she in turn, named it Liverpool. 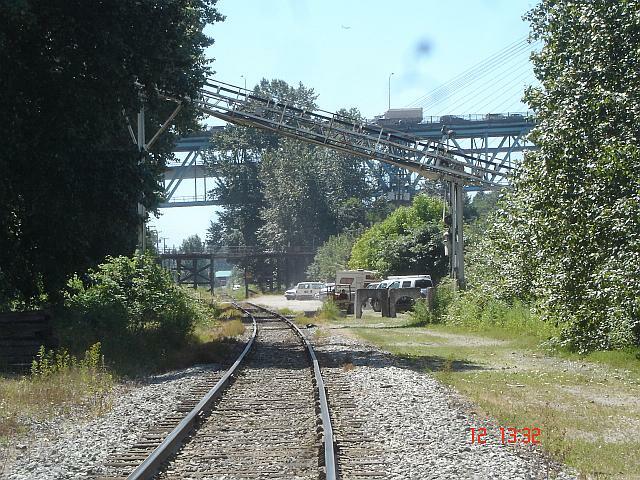 The train proceeded to the boundary line, where a ceremonial meeting of trains joined the two lines, the Fairhaven Northern and the New Westminster Southern, together. Much banqueting ensued, at Blaine, at Fairhaven, and at New Westminster. The grandiose plans for a new city of Liverpool at Herring’s Point would soon fizzle out. The railway would first extend its line to the ferry terminus further downriver, and in the coming decade cross over the river by bridge. Tillman Herring ran afoul of the law again in 1891. Tillman Herring was fined for his trouble, though the reasoning is not clear as to how he, drayman, could otherwise deliver this material to his customer while there remained in force an Act prohibiting carriage and storage of explosives within the City limits. Tillman’s uncle, William John Herring, attracted attention in the Victoria press in 1891 where he was a well-known character, engaged for some years in hotel jobs, notably as a baggage handler. A report of his divorce was copied from the San Francisco Examiner. “What drove him to drinking so hard?” asked the court. Bill Herring and Mary had three children, the best known being Tillman Ringold Herring, who served in the Spanish-American war and became a Fire Commissioner in San Francisco. With development of railways eating up strips of land, with wharves and docks being erected, townsites planned and hotels built, Hannah Herring remained in possession of the original Surrey homestead, but its status remained uncertain. In Feb 1892, 13 years after the death of Sam Herring, the family was still trying to formalize their right to the property where they had resided continually since 1860. The same year CS Wylde, who for a time had charge of the Revenue Service at Langley and was the first lease-holder at the old Revenue Station, died in Victoria at the age of sixty-seven. Long after the death of Samuel Weaver Herring in 1879, his time in the courts had not come to a close. In 1894, a property he had owned since 1858 at Whatcom, and apparently forgotten by all, became the object of a landmark court case in US municipal law, involving “the assessment and sale of property by a city for a street improvement in the name of SD Henning, instead of SW Herring, who was the true owner.” The case was decided on appeal to the Supreme Court of the State of Washington in 1896. Felker had been appointed to administer the estate of Herring in 1894 and immediately began proceedings to recover the property. The court decided that Herring owned the property in fee simple prior to August 22, 1879. When improvements were advertised to “pile and plank” and to excavate, fill in and level the streets and to make sidewalks, Herring’s property was assessed for the improvements along with others, and when Herring failed to pay, the land was sold at auction in 1884 to Pettibone, who afterwards conveyed the property to the City of New Whatcom. The Pettibone brothers, related by marriage to RV Peabody, had been in Whatcom in 1858 with the Herrings, afterward relocating to Langley and Victoria. Among the reasons given by Felker to recover the property, was that insufficient notice was given, and that the City record of his name was incorrect. 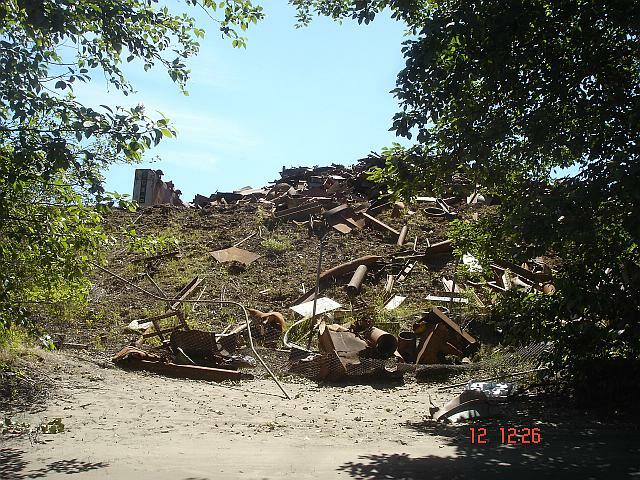 All arguments were rejected by the Court as insufficient and the City kept Herring’s pioneer lot. Lot 5, Blk 33 was located on 13th Street, which is present-day West Holly Street, between E Street and F Street. 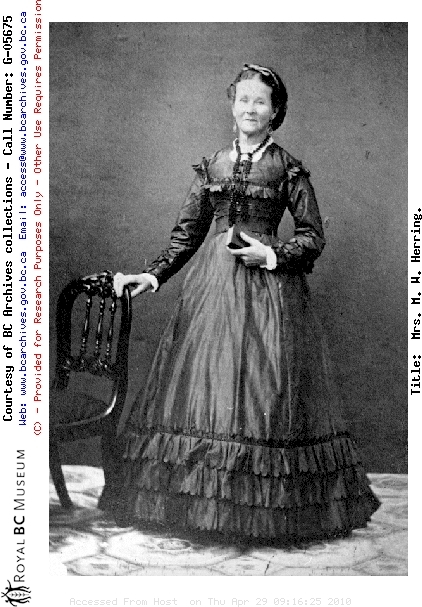 Pioneer of California, Washington Territory and British Columbia, Hannah Herring passed away on April 6, 1895, aged 67. At the time of her death she was living at her daughter Annie Jaques’ residence on 2nd Street, New Westminster. Her pallbearers included Mayor Shiles, JC Armstrong, JA Calbick and some of the last living pioneers of the Lower Mainland: F Eickhoff, James Wise, and Henry Eickoff. All proceeds went to costs. Henry Holbrook Herring, New Westminster-born son of Samuel Weaver Herring and Hannah Herring, died soon after his mother, July 3, 1895. 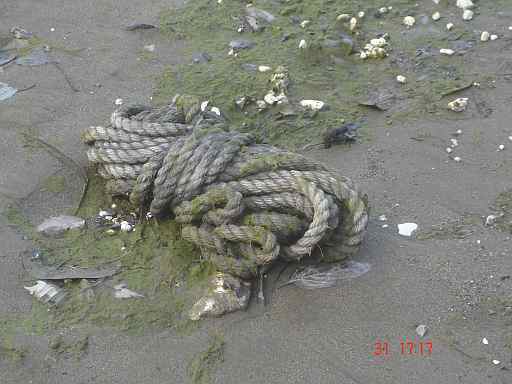 He had been a fisherman on the Fraser River, but had suffered ill health for some years. Annie Mary, widowed since the passing her husband JG Jaques in 1893, remarried in 1895 at the age of 37 to widower James Anderson of New Westminster. A native of Glasgow Scotland, Anderson had come out to British Columbia in 1887 on the first CPR train to Port Moody. He went into business in New Westminster and started the St Mungo Cannery, at the site where the Alex Fraser Bridge now reaches the south bank of the Fraser River. Annie Mary would give birth to a son, Robert Henry Anderson, in August 1896. The Andersons, including Annie’s step-daughter, Alvie Jaques, lived on a large city property at the corner of 2nd St and Queens Avenue. Tillman Willard Herring managed to retain possession of a portion of the land held by his father and mother. 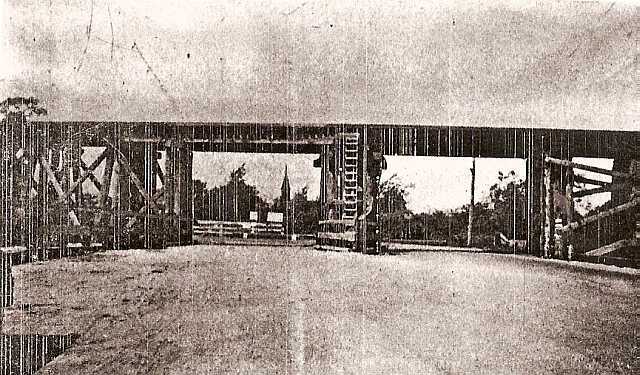 When the approach to the bridge of the Canadian Northern Railway was constructed, access to Herring’s land was cut off. 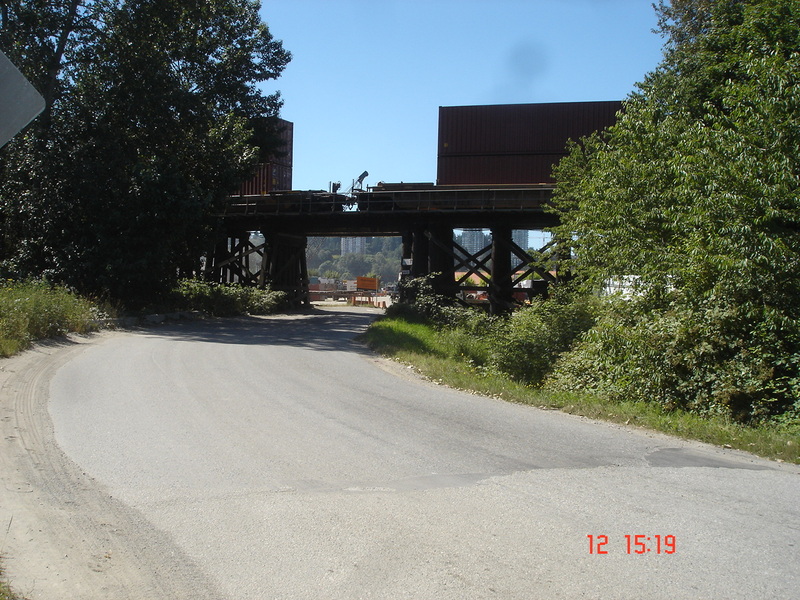 To accommodate him, the road known as Musqueam Drive was extended from the planked Bridge Road. Tillman chose the year of the opening of the Westminster Bridge, 1904, to surrender his bachelorhood, at the age of 46. His bride was widow Mary Caroline Ling Herrling. A daughter of a Cowichan Indian she had first married at age 16 to Charles Herrling a 49 year old Hungarian who settled near Hope, BC at ‘Herrlingville.’ He had passed away at the age of 76 in 1901. Tillman’s marriage would not be a lasting union. In 1907, Tillman Herring appeared before the fisheries commission, arguing for increased conservation measures to protect the salmon run. Herring was described as “a fisherman living above New Westminster Bridge.” He stated that he had been fishing on the Fraser since 1874. He advocated a 48-hour closure, to ensure an escapement of fish upstream, as that was the time, he observed, that the fish needed to get above Mt Lehman. In 1910 Tillman was reported in the newspaper as being in possession of an early map of Queenborough, which he inherited from his father SW Herring. In the 1911 Census Tillman Willard Herring, aged 55, and his uncle Tillman R Herring, 63, are recorded living in the same household with Tillman W Herring’s new wife Mary, nee Herrling and her son, and a nephew, Edward Stoves. 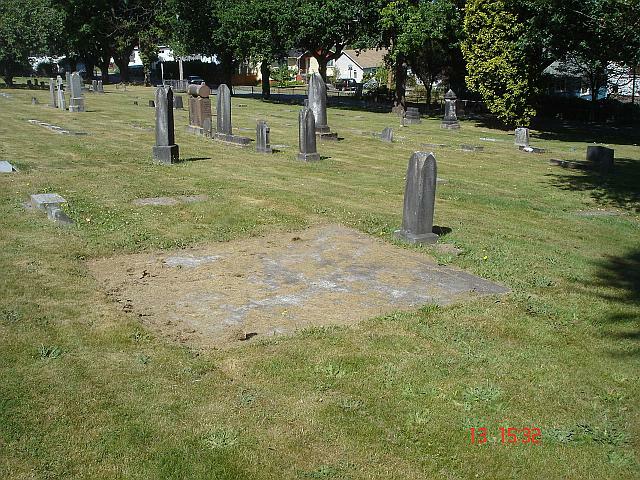 Tillman R Herring, brother of Samuel W Herring, passed away in New Westminster in 1913 at the age of 65 and was buried in the Masonic Cemetery. He had lost contact with his family in California. James Anderson, husband of Annie Mary passed away in 1923. He was survived by his wife, by his son Robert, and his married step-daughter Alvie Wooster. Annie Mary died in 1929 at the age of 71. Born in Crescent City, CA, she had come up with her parents in the first years of New Westminster and had since lived 44 years on her property on Queens Avenue. Son Robert Anderson, unmarried, lived in the family home. Her daughter Alvie Wooster lived around the corner on the divided family property on 2nd Street. Tillman Willard Herring lived until 1937, the last link to the property of the old Queenborough Revenue Station at what became known as Herring’s Point. His obituary in the British Columbian—“Pioneer River Skipper Dead“—described him as “one of the first residents of New Westminster,” and a member of the Hyacks since 1872. He had become a river boat Captain, a pilot and fisherman and fish vendor. In his latter years, at least until 1935, he was a newspaper vendor on Columbia Street in New Westminster, where he would regale customers with stories of pioneer days on the Fraser River. Alvie Wooster, the adopted daughter of Annie Mary, died in 1954 at the age of 67 in White Rock. She was survived by her husband Captain WS Wooster, three daughters, and her step-brother, Robert H Anderson. Captain William S Wooster would live until the age of 94, passing away in 1970. Robert Henry Anderson, son of Annie Mary, died in 1980, aged 84. He was the only known direct descendant of Samuel Weaver Herring and Hannah Herring, and he was unmarried. Herring’s Point in the first decade of the 21st century offers little hint of its past. The Indians have long gone, taking with them their graves. There are no meadows of wandering cows, no gardens, and no sign of the richness of the soil. The canneries no longer hang over the river filled with steam and charcoal fumes. No longer do thousands of celebrating Indians camp here at festival time, canoes pulled up on the beach. There are no gangs of navvies to build the iron road and camps redolent of Chinese cooking. No stragglers make their way down along the Telegraph trail from Langley and none need to chance dangerous crossings on the ice filled river. There are no shooting matches with soldiers from the Island. Nor do cannon balls whiz overhead from war ships taking target practice at the Brownsville butts. The railway tracks laid down 1890 are still there and the railway bridge built in 1902, but the large “Liverpool” wharf has long since rotted away. 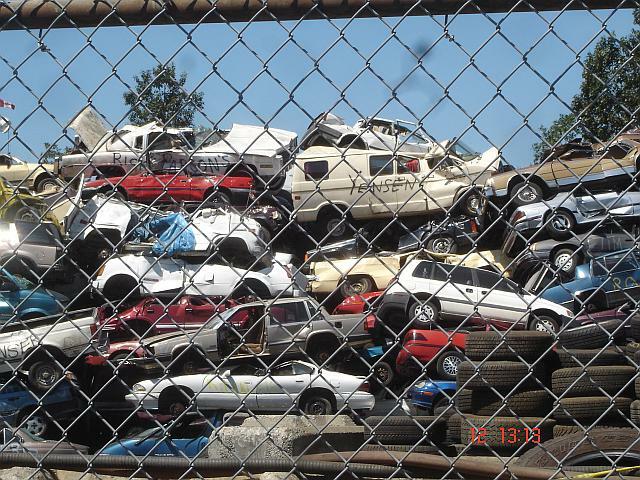 The site of the old Revenue Station is now covered by a scrap metal salvage yard. Yet going through the underpass of the railway bridge approach, from 112th Avenue, you view the Ritchie Bros auction house on the riverbank, reminiscent of the house built for Captain James Kirk at the Revenue Station, and you can wind along Musqueam Drive skirting the edge of the old (reduced) Indian Reserves to the place where Sam Herring’s cows once wandered (all too) freely. If you don’t mind risking a warning of trespass from the Harbours Board, you can find your way beyond the scrap heaps to a small beach and a slough with a fine view of the river and on the other side, the hillside where the Engineers encamped. You can appreciate the strategic value of the Point at the river bend. It is hard to imagine the bounty of prize-winning vegetables and fruit that once grew here, but to the south, near 128th St, you can still find vestiges of the bog that separated the Revenue Station from the uplands. There is an accessible public wharf at the foot of 130th St with a fine view of the river and the mountains and a sense of the rise and fall of the river. The foot of 126A St, where the city has a pumping station, is the site of the old Liverpool Railway Station, where once alighted Emma Juch in all her finery. 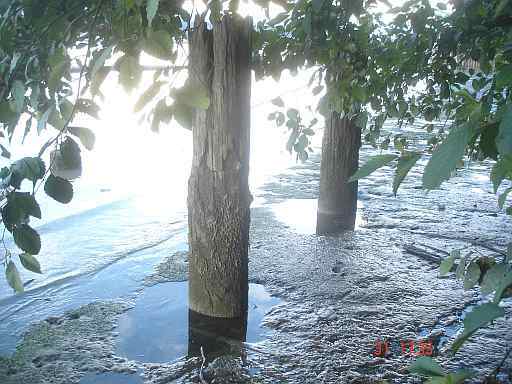 Here branched the siding to the wharf where the bark Astoria landed rails in 1891 after an epic journey of 10 months. 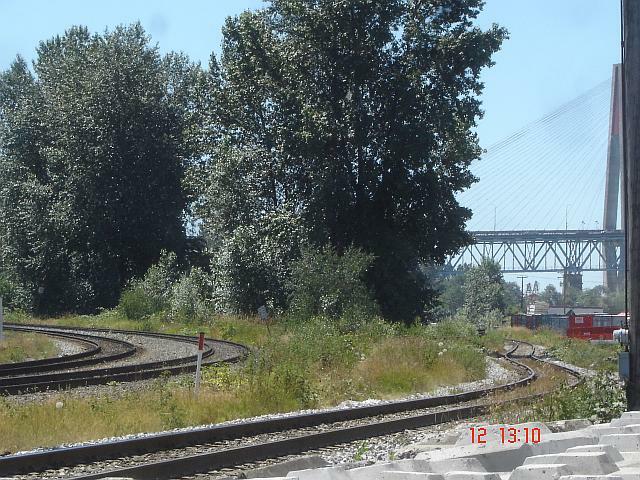 Now you can cross the tracks to a small rough beachfront at the side of a slough. To the west, on the old property of Ebenezer Brown, first cleared by John Robson, the access is easier. Old Yale road is still a little crooked, home-made by Brown on this section leading to the site of the old wharf that was the terminus of the Trunk roads and a landing for the ferry K de K. Approaching the campground on the left stood Punch’s Brownsville Hotel. The park at Brownsville Bar offers good views and good fishing. “Brown’s ditch,” remnant of a slough which once drained this low land, can still be seen marking the boundary between John Herring’s Lot 2 and Ebenezer Brown’s Lot 3. "But first glance with me at the river on our right, broad and clear and wider than the Thames at Westminster, and across it at these narrow flats, with a few shanties on them scattered here and there, with blue wreaths of smoke above their chimneys, and a long, low, white cannery, reflecting the sun, under the gentle slope of a hill covered with fir and pine. Then see how the river spreads out above this to twice its breadth below, bending away to the right until it takes no reflections, but throws out sparkles from the ripples of a solitary gust of wind and in a moment is lost to sight. 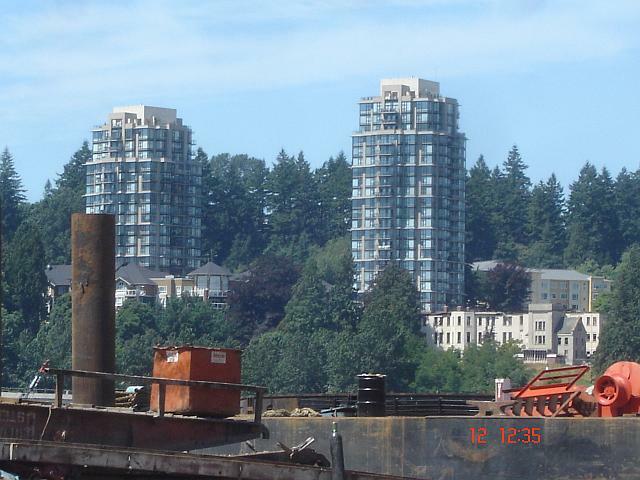 . ."
Old view from New Westminster. Tsimlana and other Indians, 1859 and before. Revenue Officers at the Revenue Station, from February 1859. WH Bevis and Mary Bevis in a house at the Station. SW Herring and family from March 1860. Downriver neighbour, Ebenezer Brown from February 1861. Where was the old Revenue Station? See the maps shown or with your map search engine locate: "Musqueam Drive Surrey BC." This road led toward the river, to the Herring place. The Revenue Station was about at the railway junction, and the foreshore is now occupied by a salvage yard. The entire Point was formerly occupied by Indian houses. 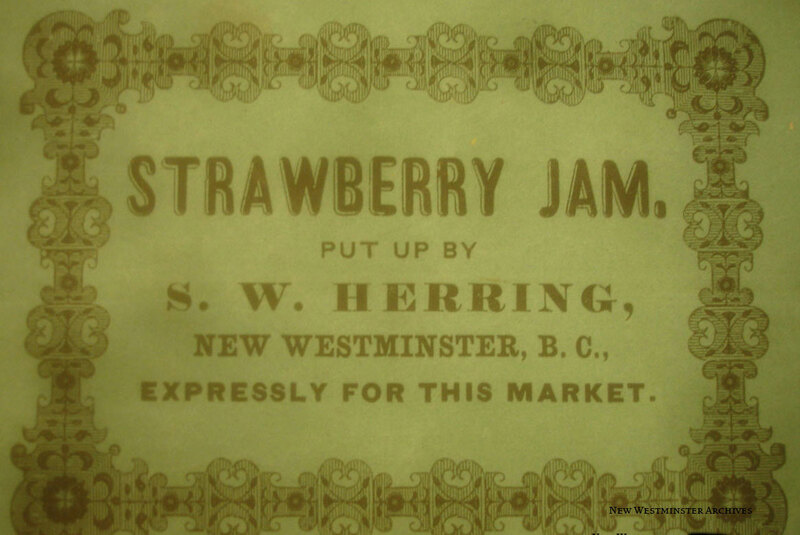 Sam and Hannah Herring entered into commercial production of their prize-winning fruit wines and jams as early as 1870, supplying British Columbia, Washington and Oregon. 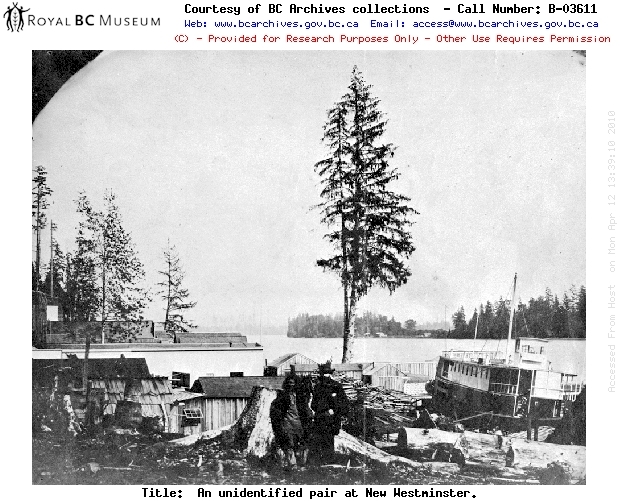 The British Columbia Archives http://www.bcarchives.bc.ca lists other photos of the Herring family for which no thumbnail images are available.